Arbakki's Magni is now an AKC GRAND CHAMPION!!!! 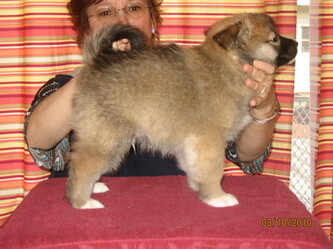 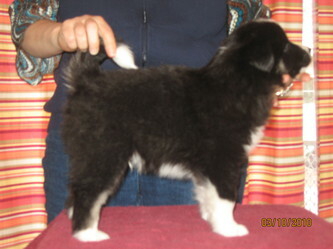 All the puppies now have a GR CH for a dad and mom Meyla has 5 points toward her AKC championship!!! 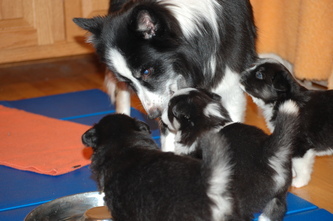 Daddy Magni comes to meet his puppies! 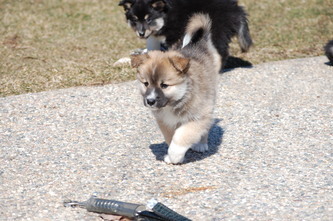 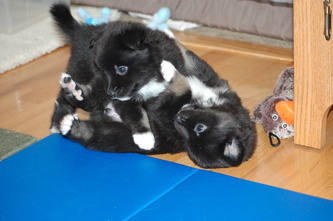 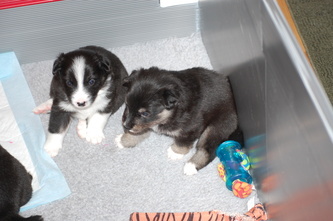 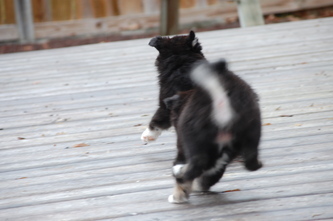 The puppies at 9 1/2 weeks old. 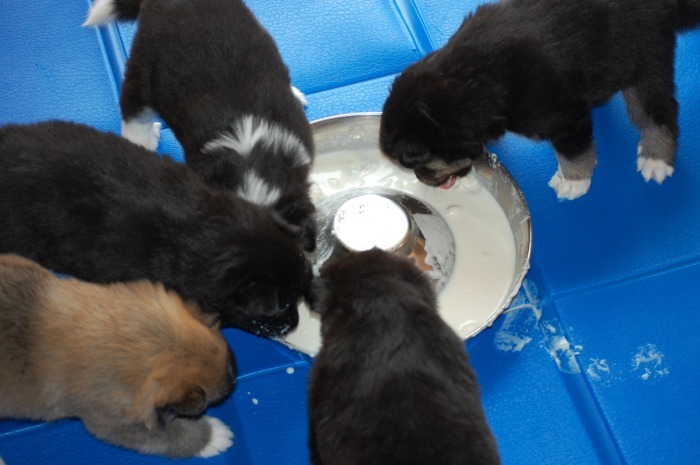 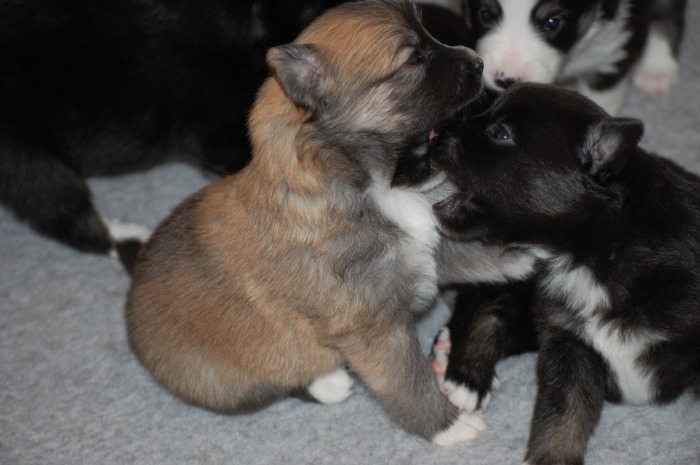 The puppies eating some mush and making a mess!! 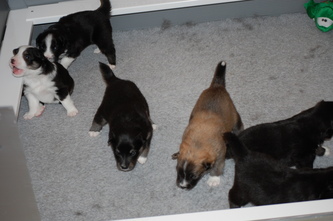 Individual pictures are 4 weeks old. 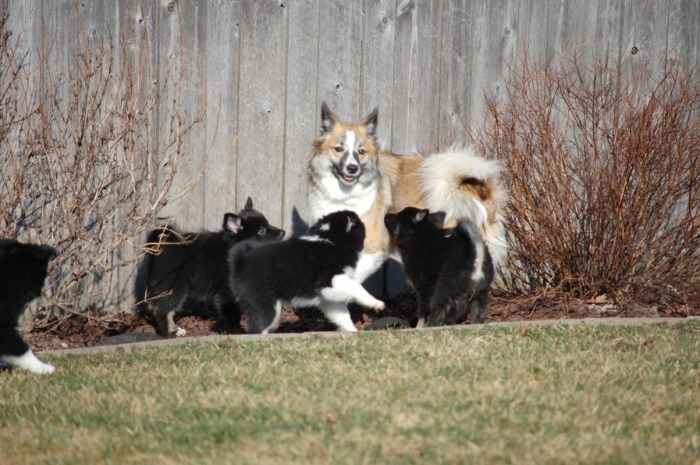 Click on the picture and a caption will come up. 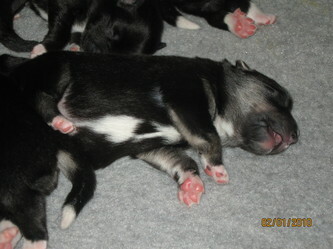 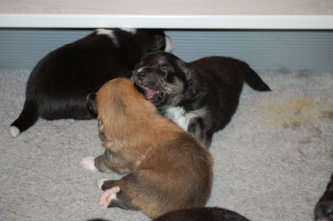 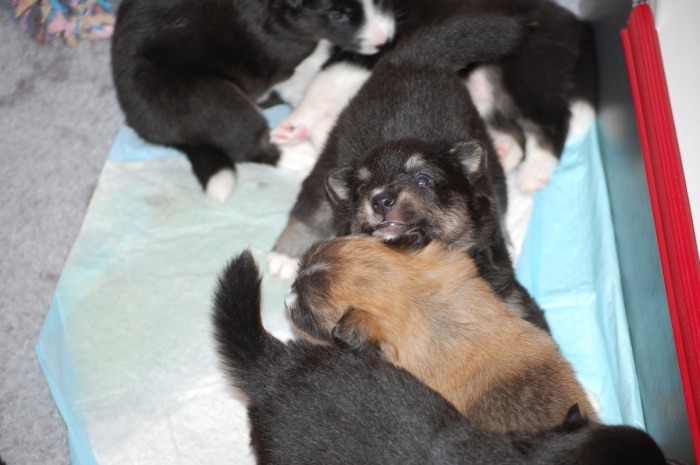 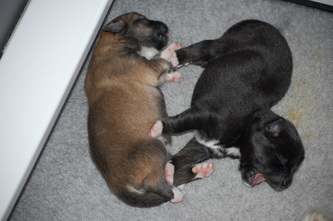 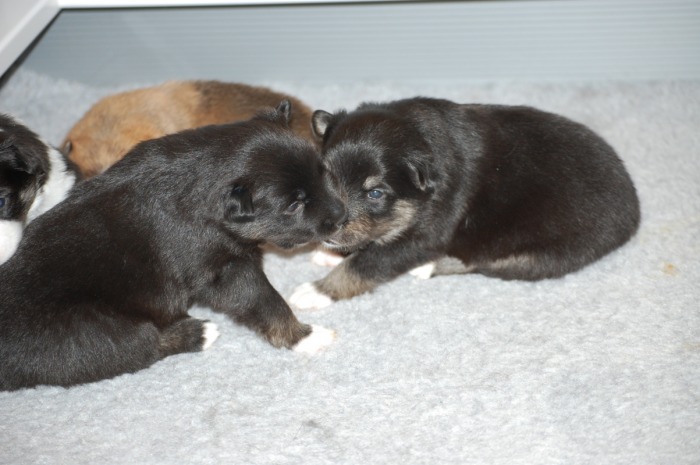 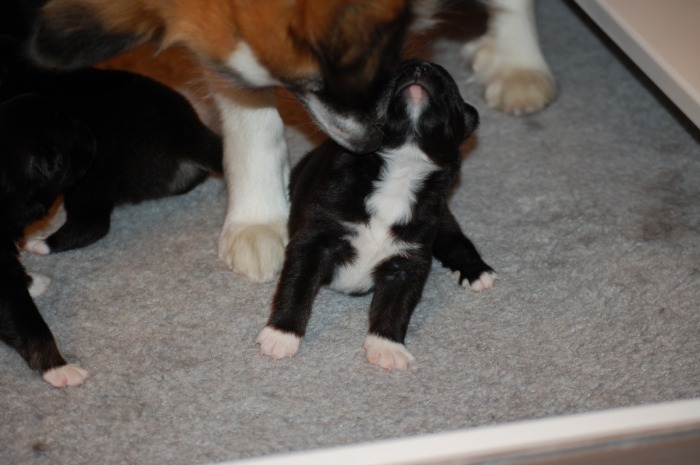 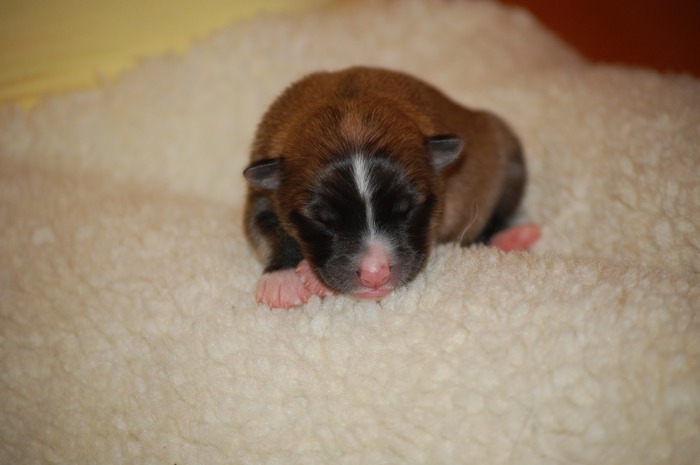 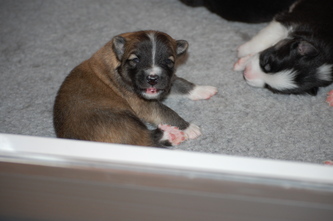 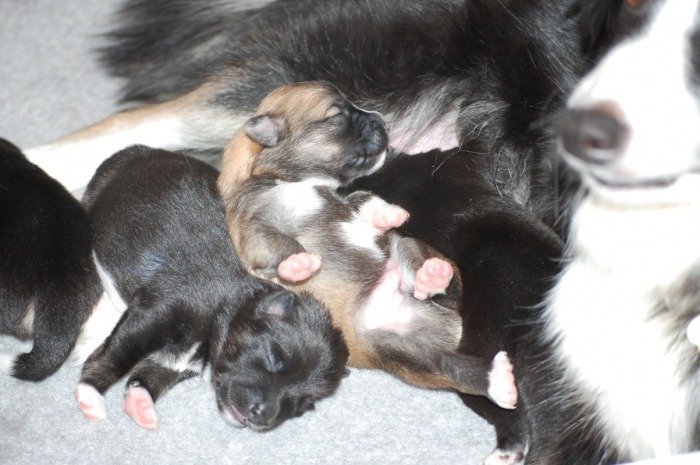 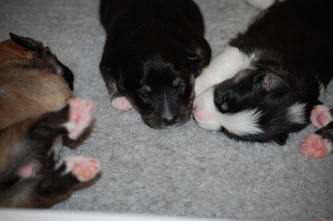 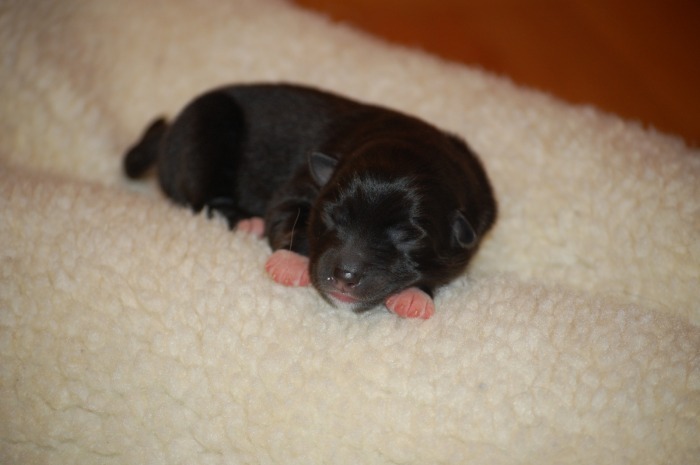 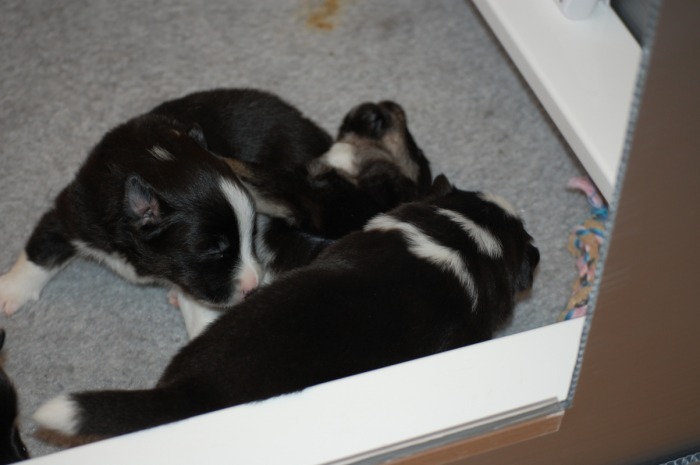 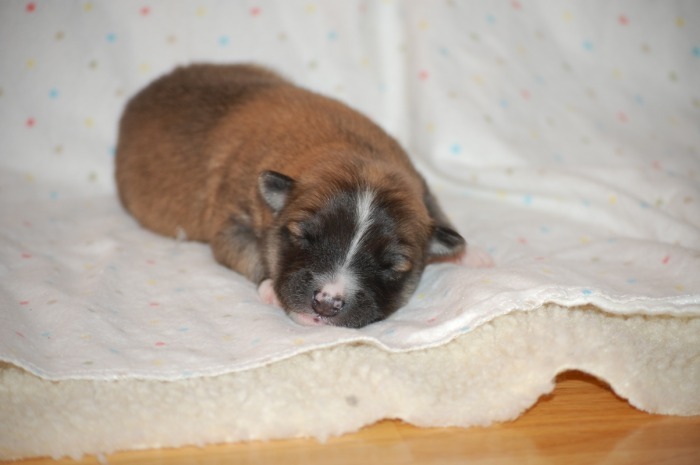 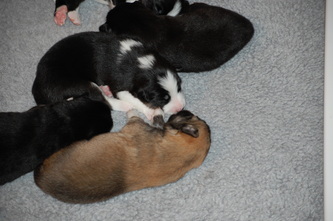 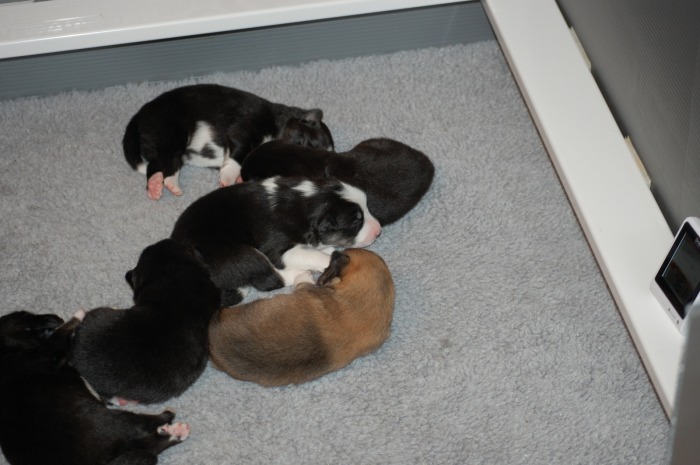 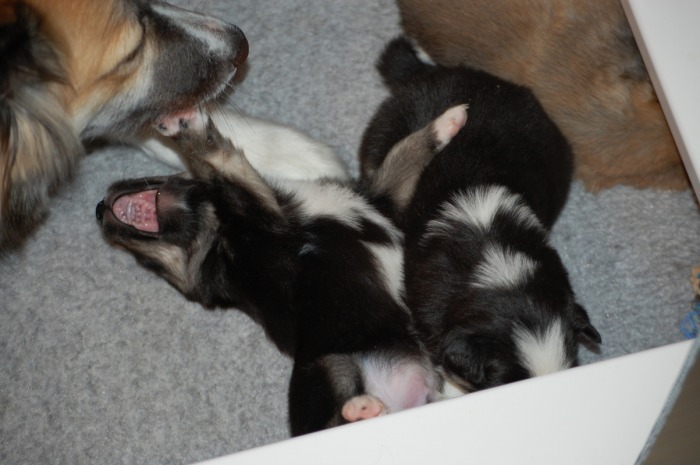 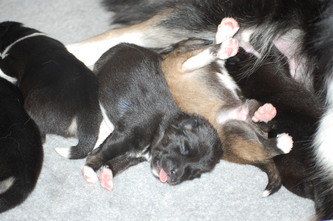 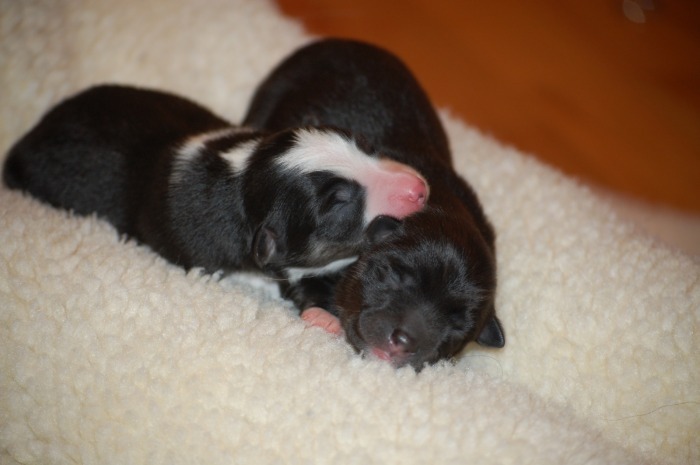 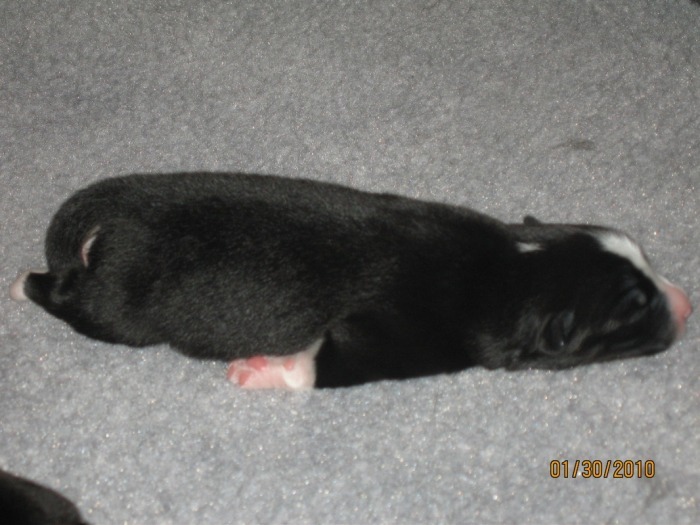 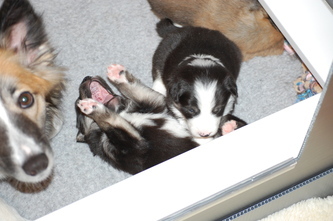 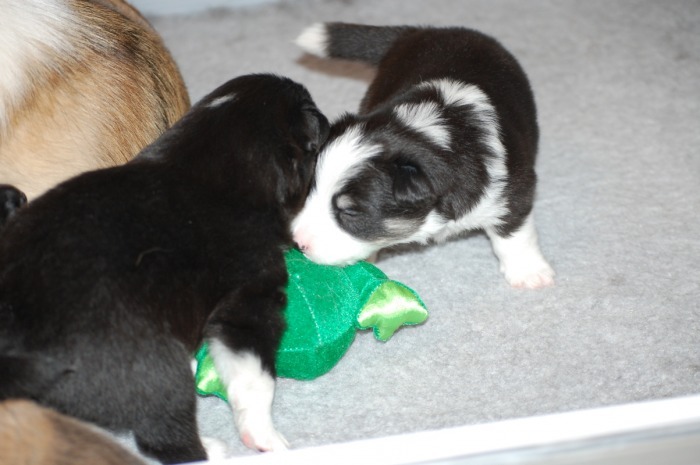 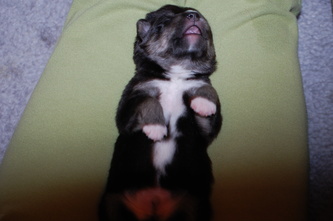 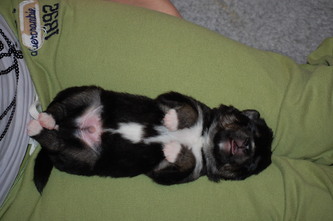 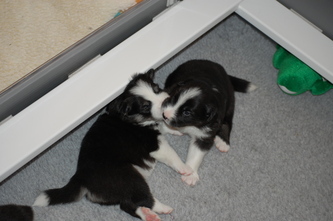 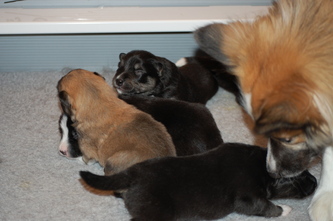 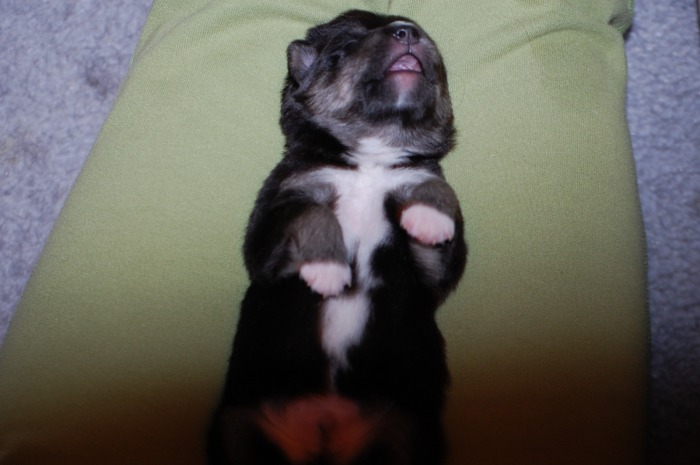 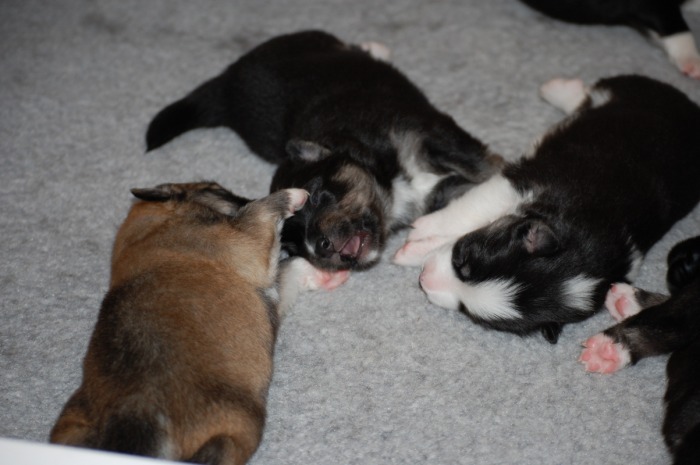 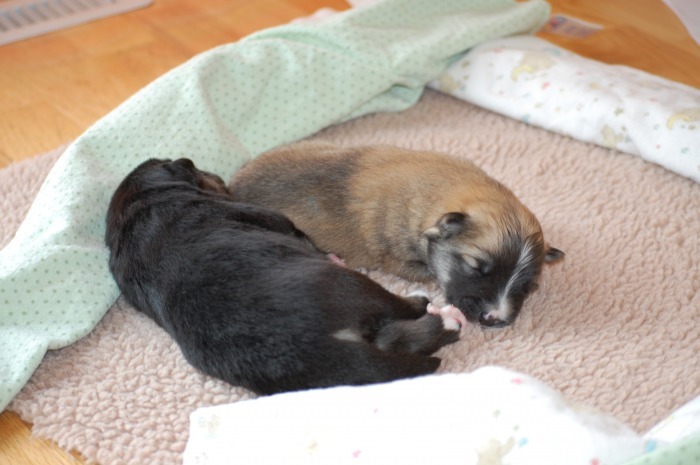 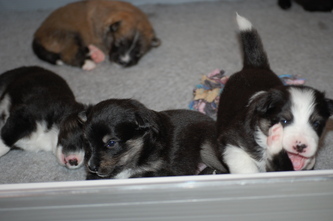 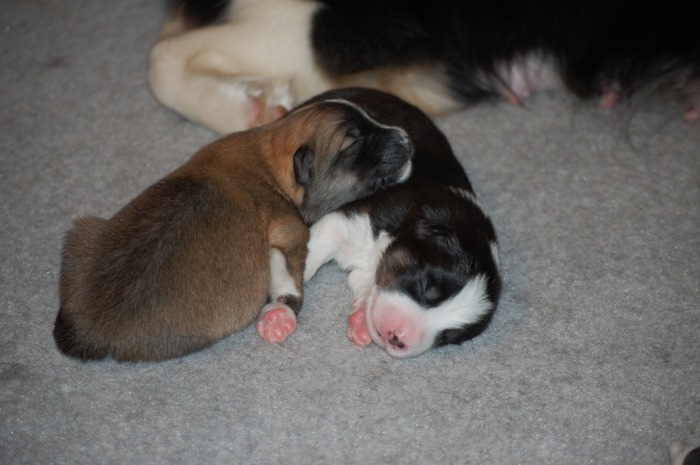 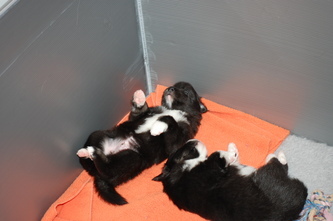 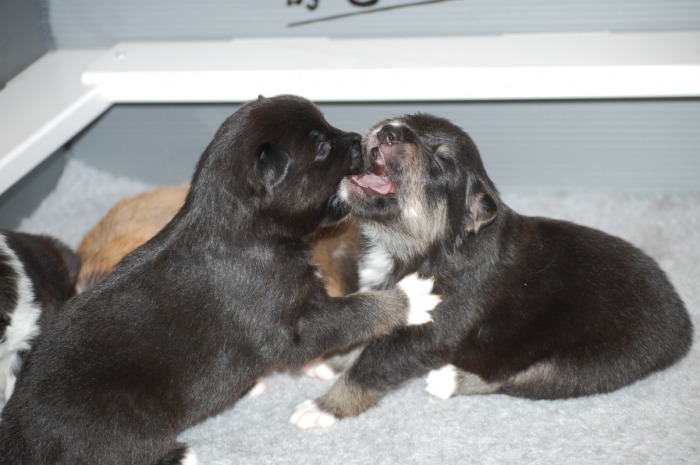 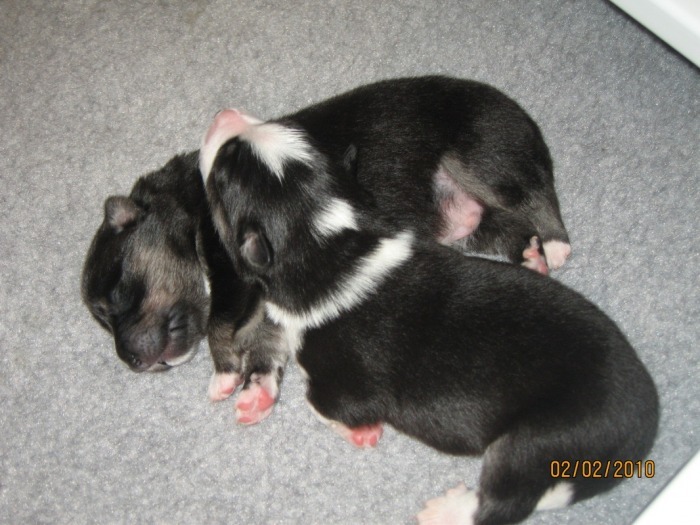 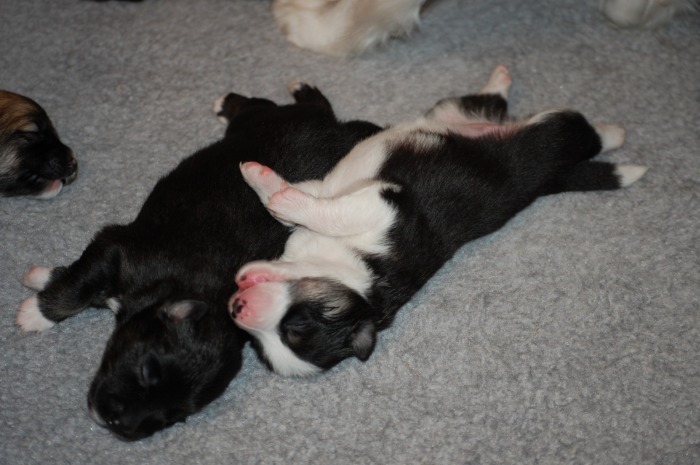 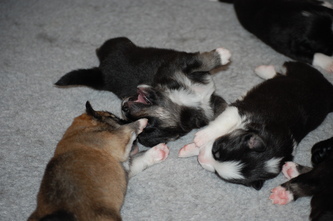 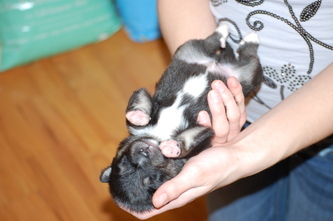 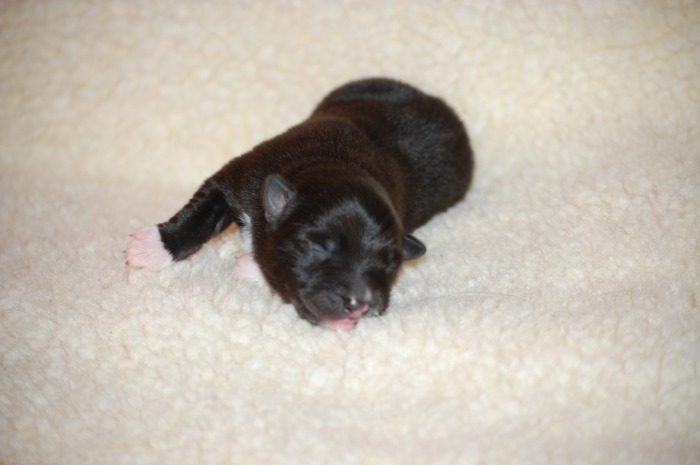 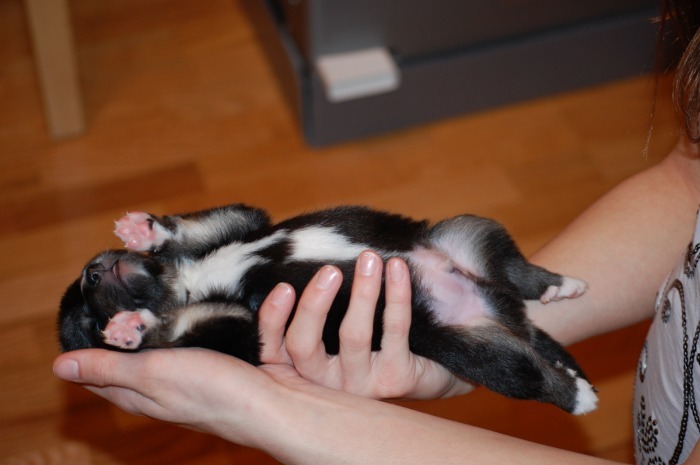 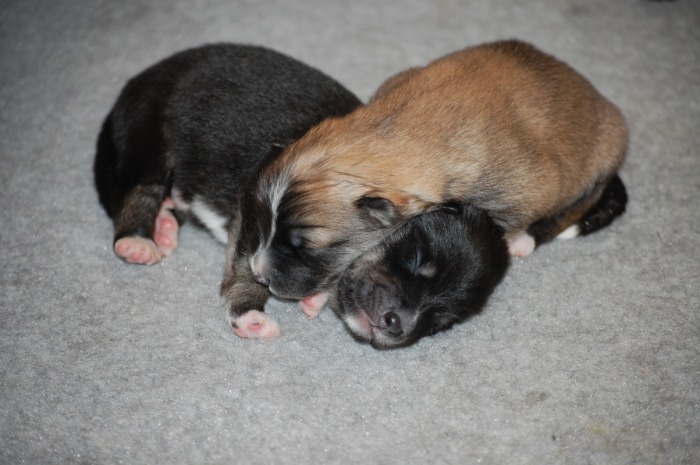 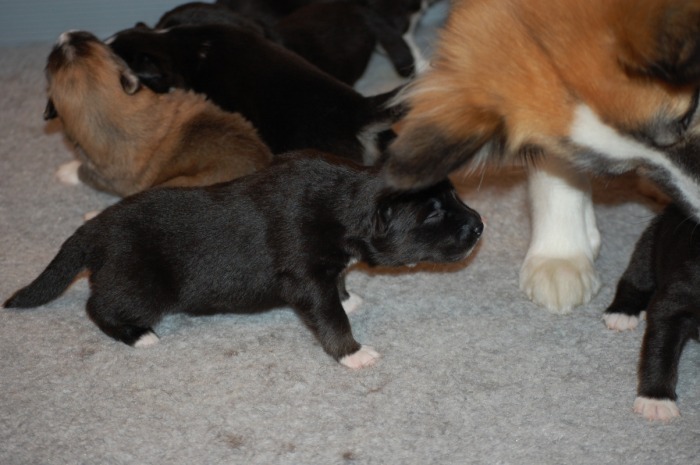 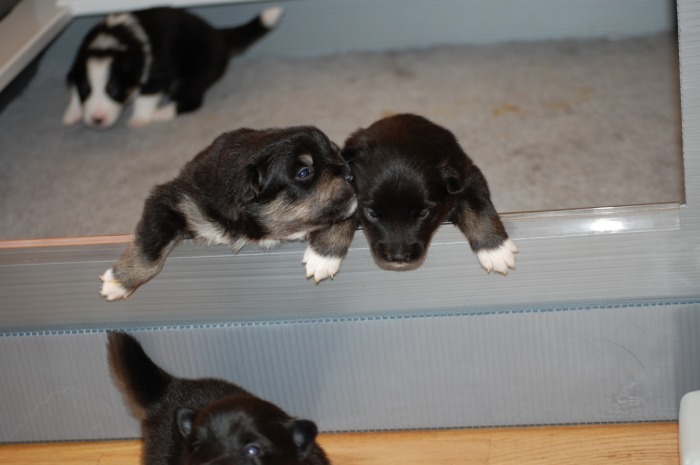 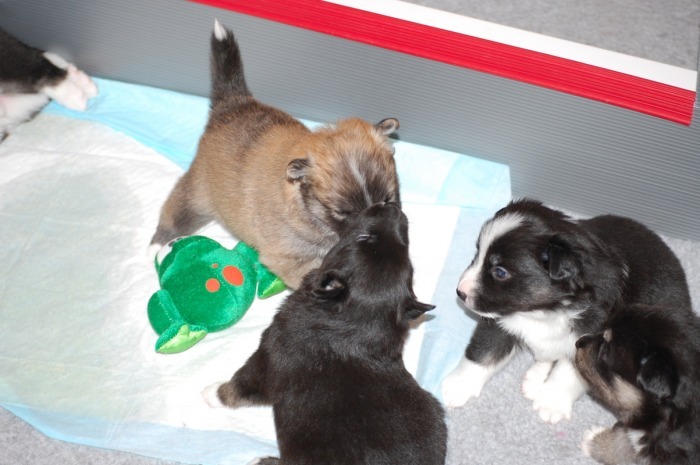 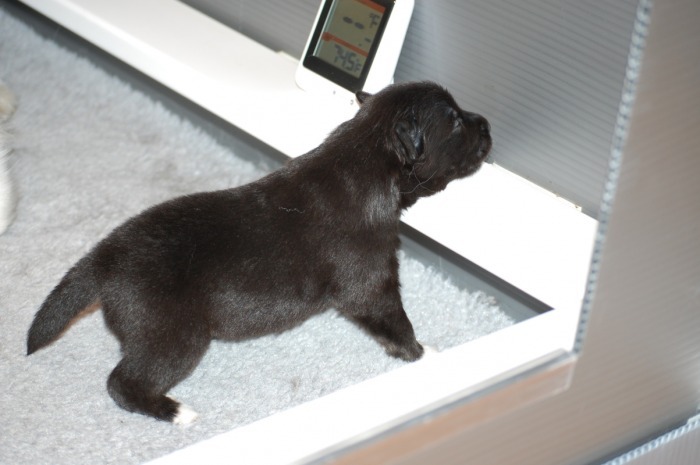 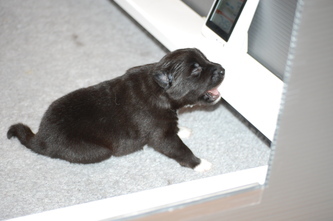 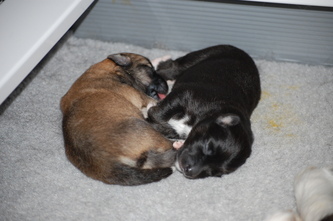 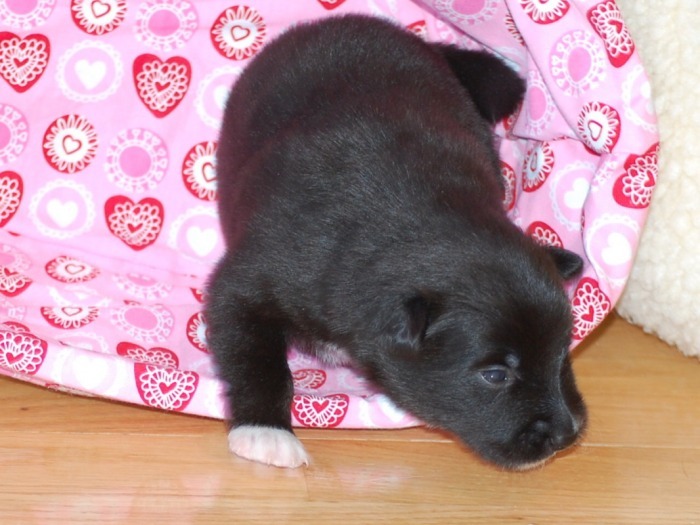 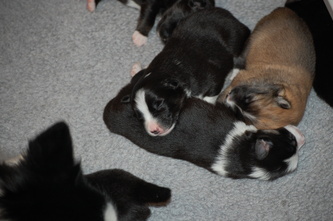 The puppies are one week old. If you click on each picture a caption will show up. 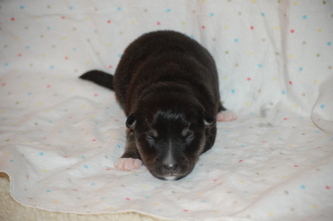 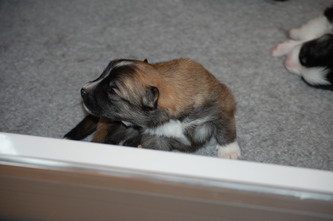 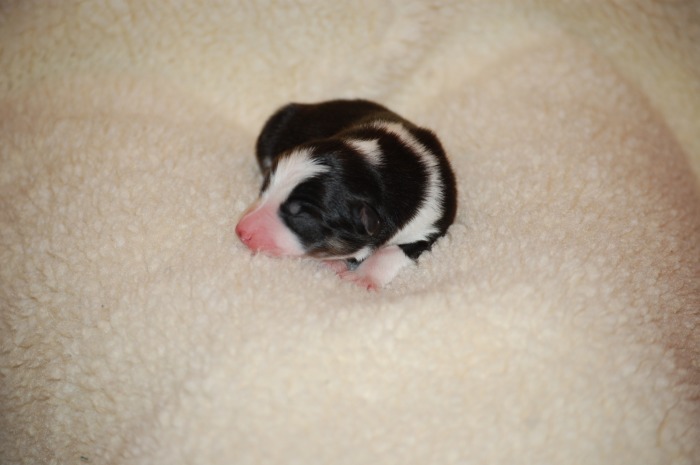 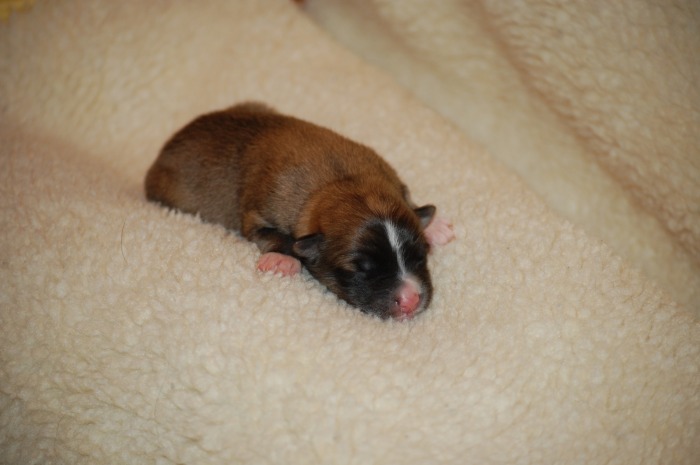 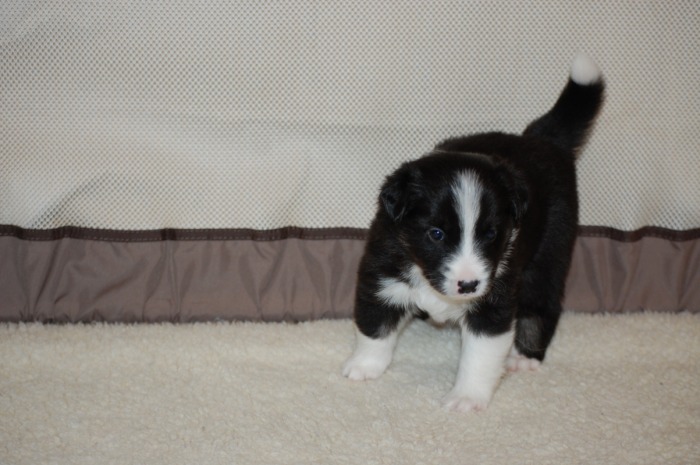 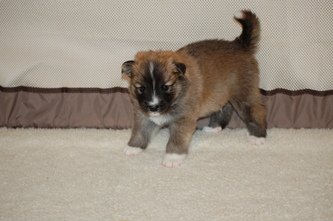 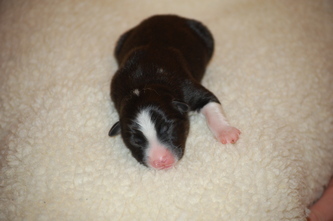 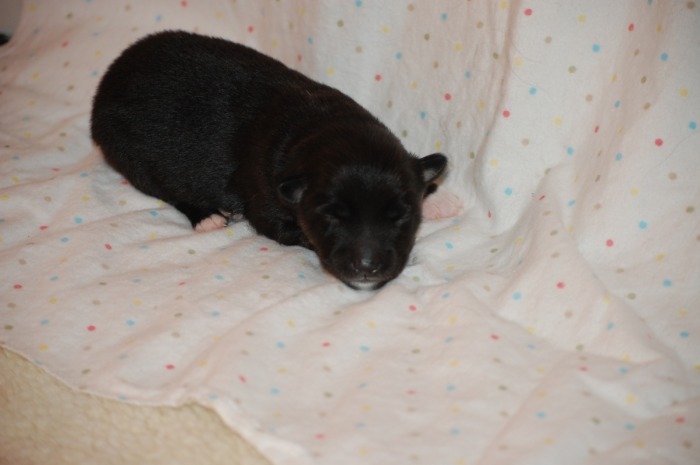 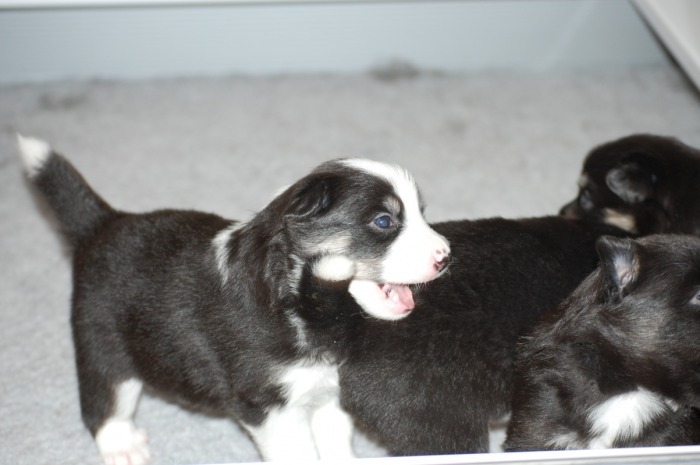 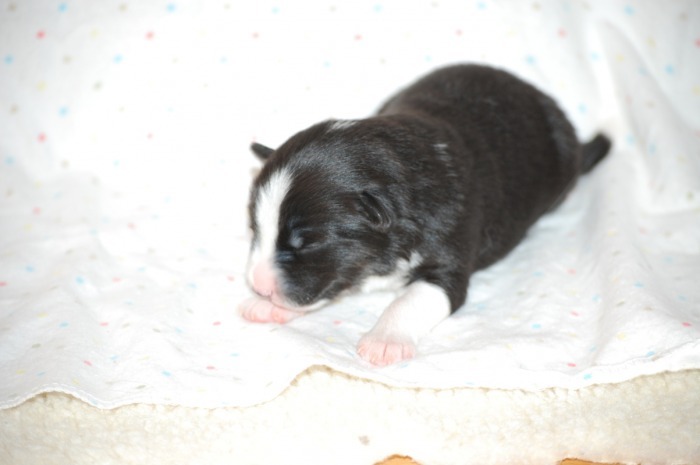 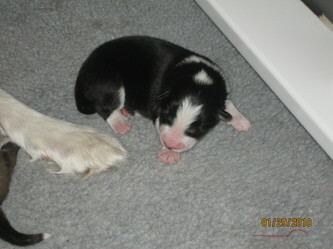 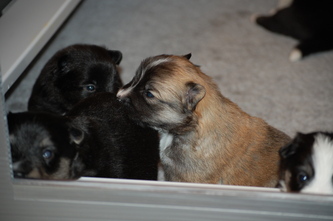 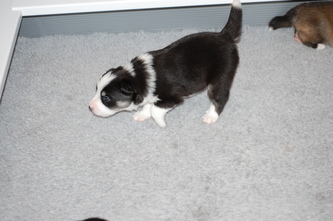 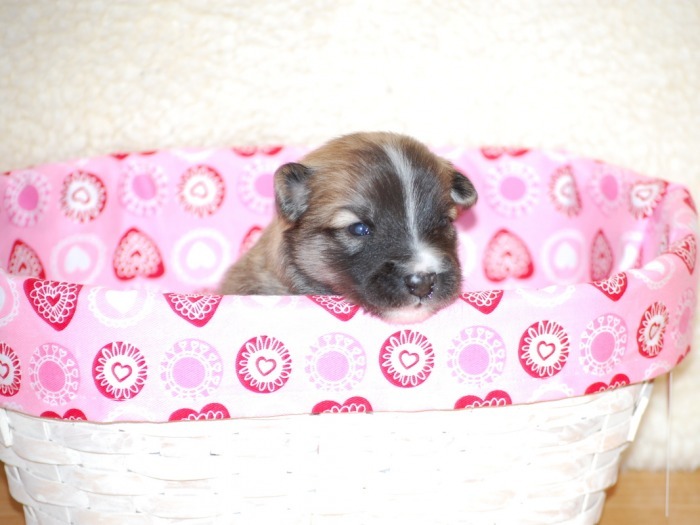 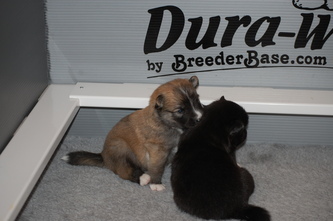 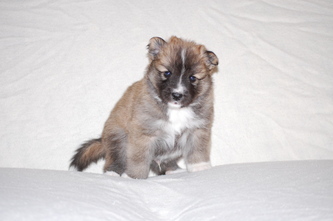 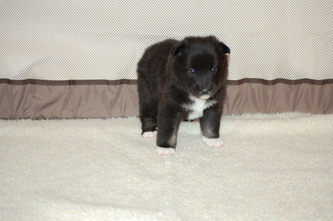 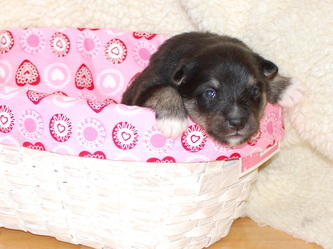 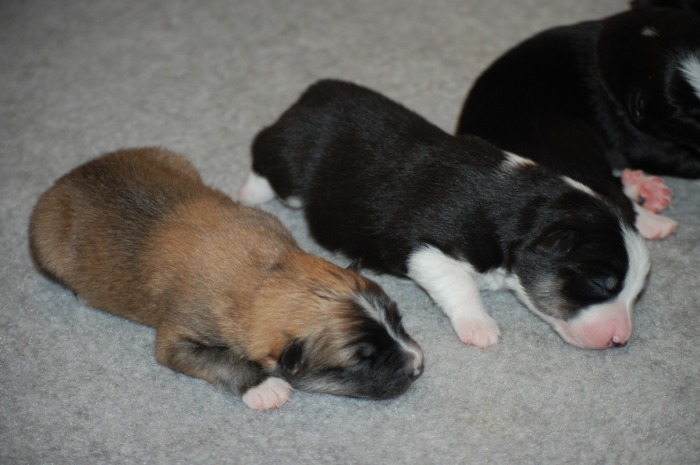 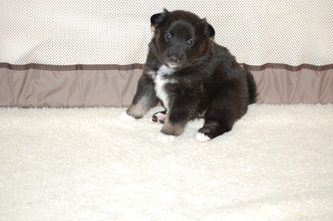 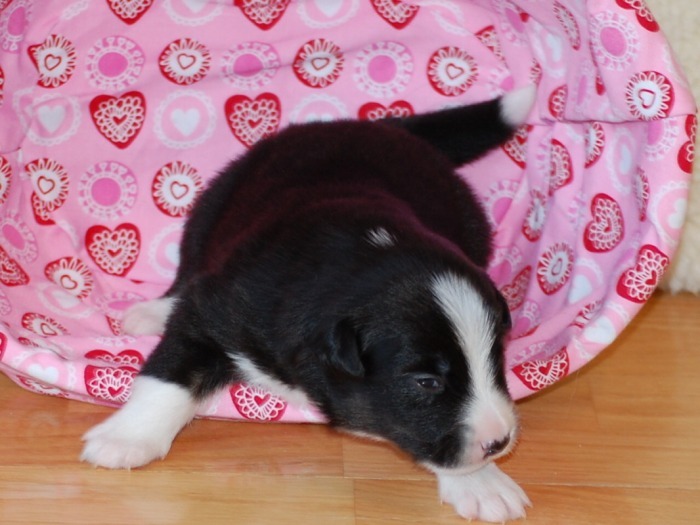 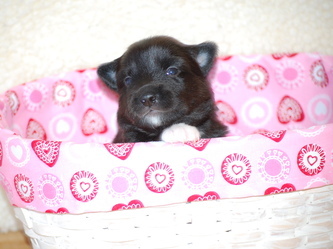 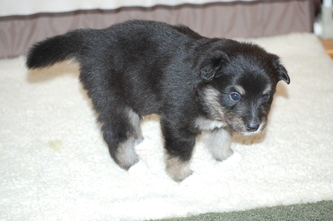 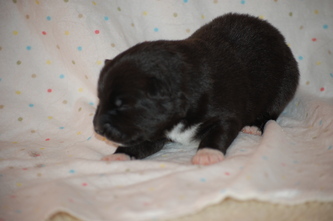 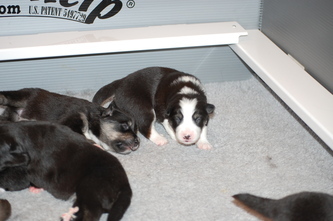 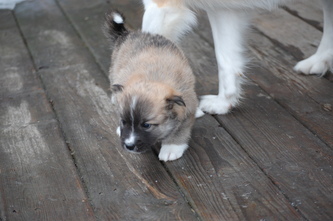 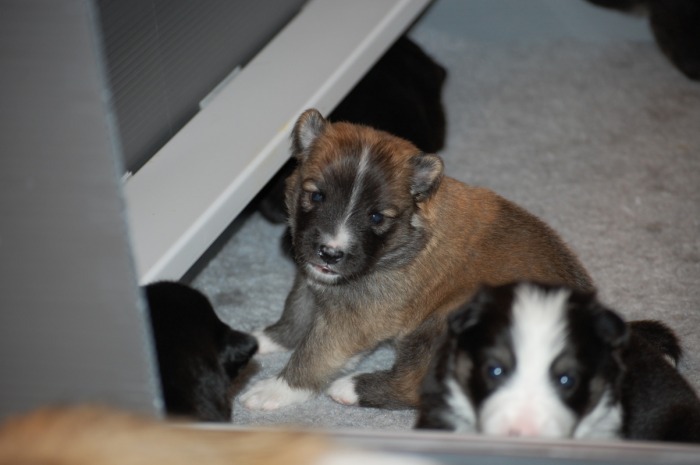 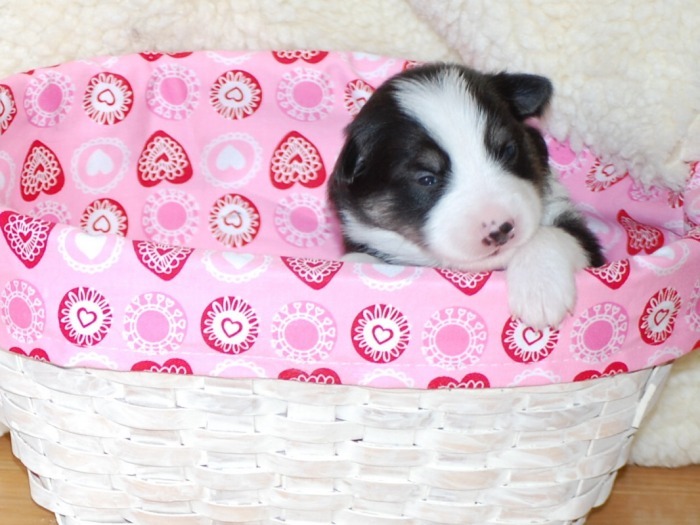 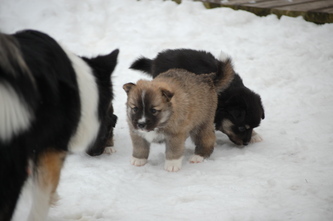 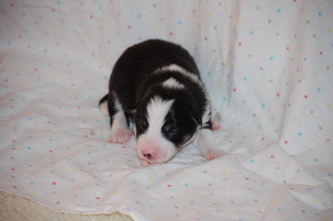 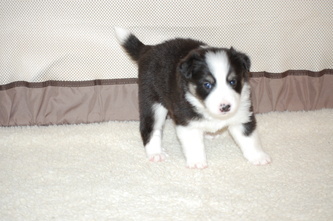 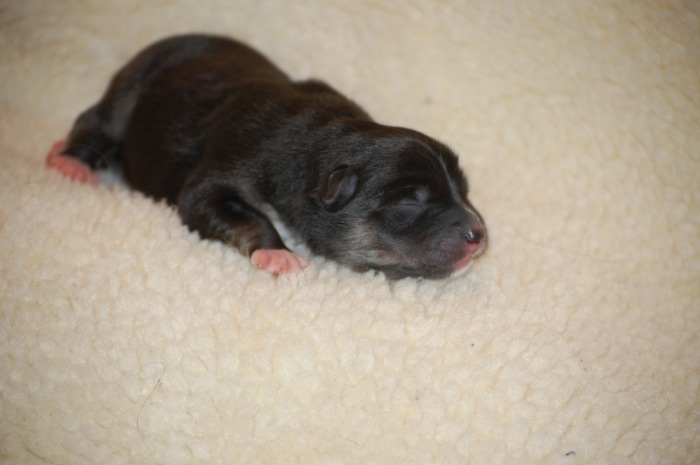 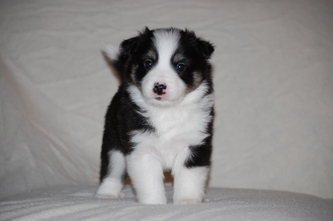 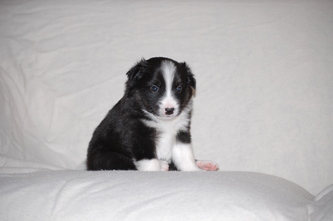 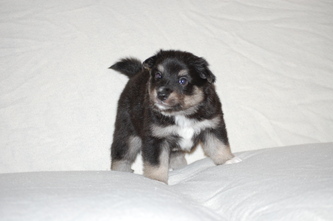 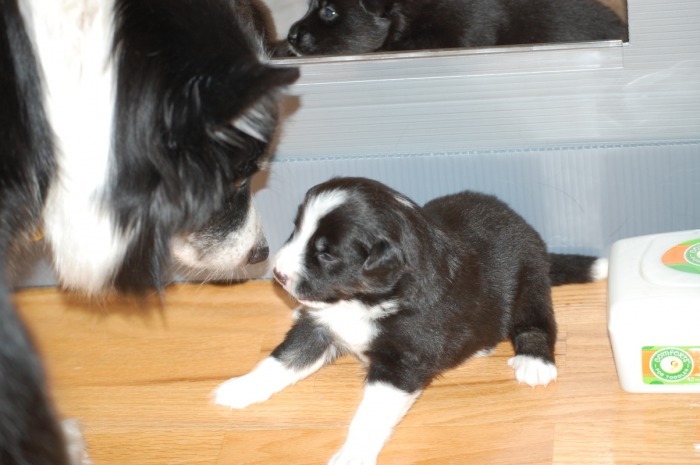 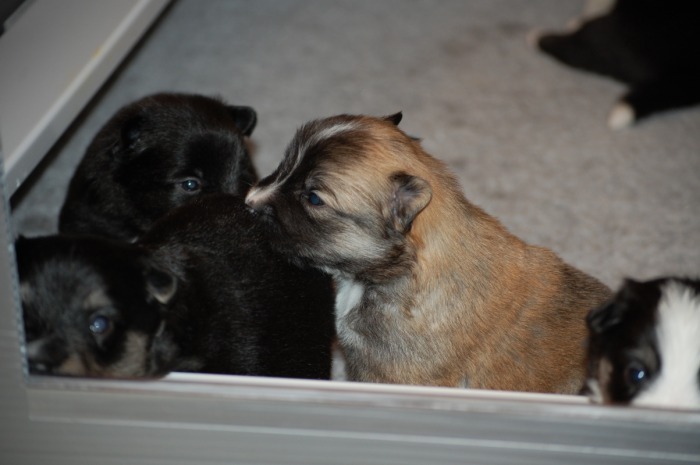 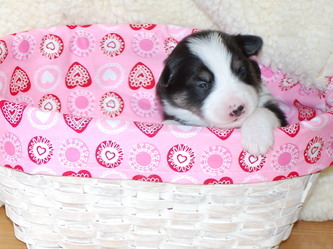 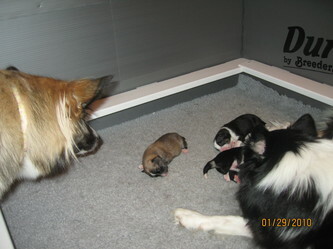 First single pup is Female 2. 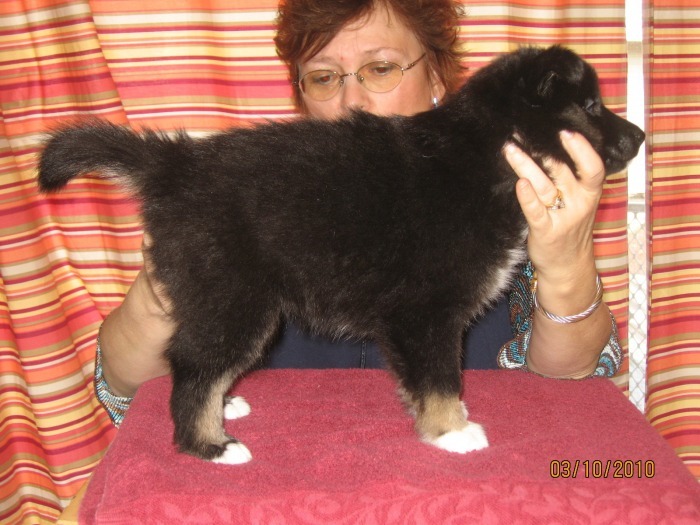 She has rear double dews and weighed 11.6 ounces at birth. Female 1 is in the middle 2nd row. 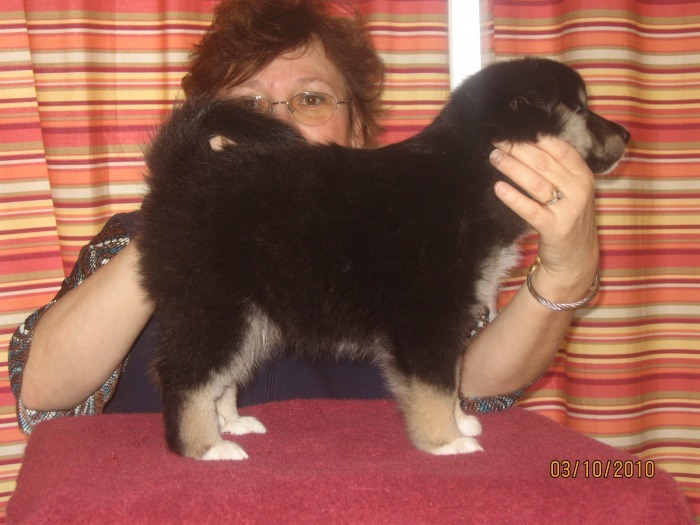 She has rear double dews and weighed 11.2 ounces at birth. Rt second row is Male 1, he has rear double dew and weighed 12.8 ounces at birth. 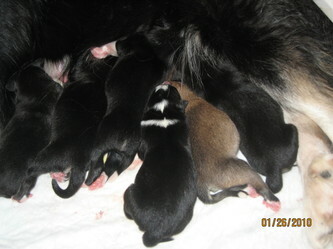 3rd row L to R, Male 1 and 2 pictures of Male 2. 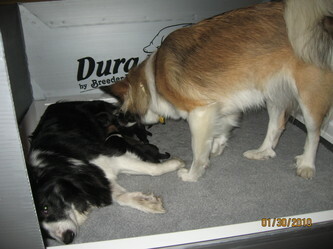 M2 has rear double dews and weighed 10.6 ounces at birth. 4th row is Male 3, he has rear double dews and weighed in at 12.2 ounces. 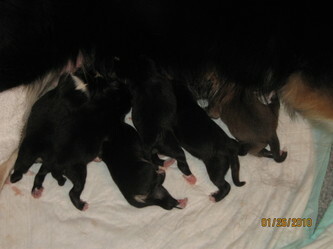 Row 5 is Male 4, again double dews and he weighed 10.5 ounces. 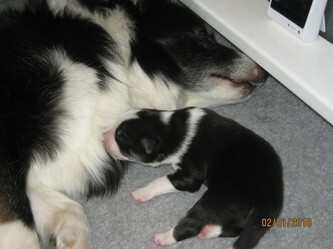 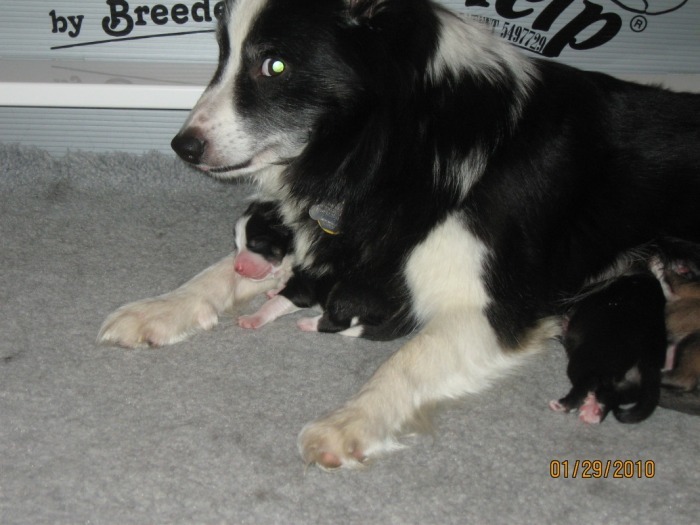 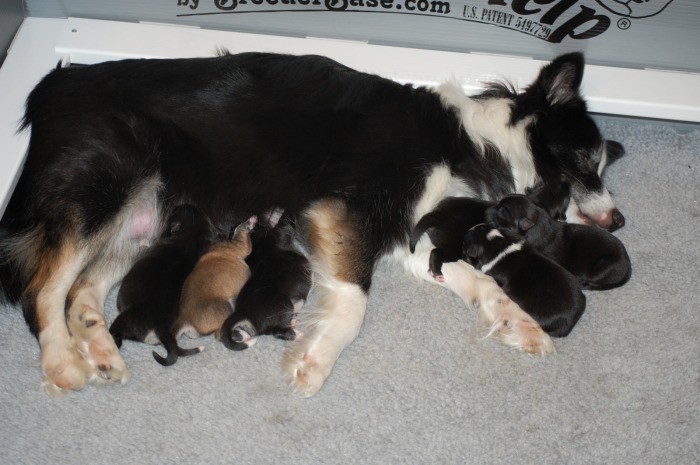 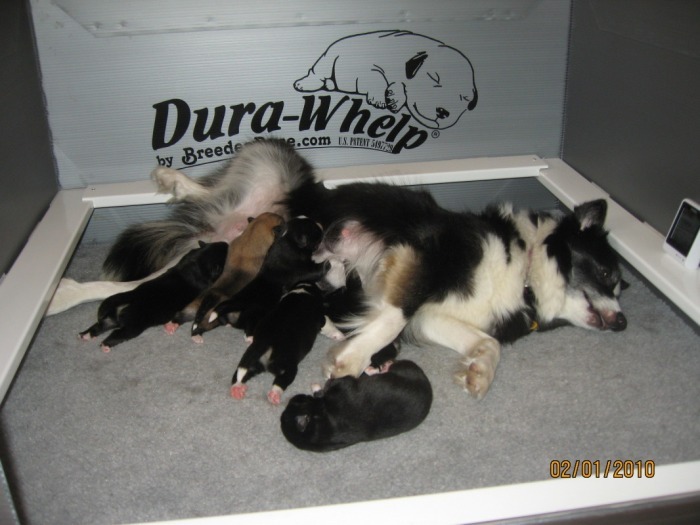 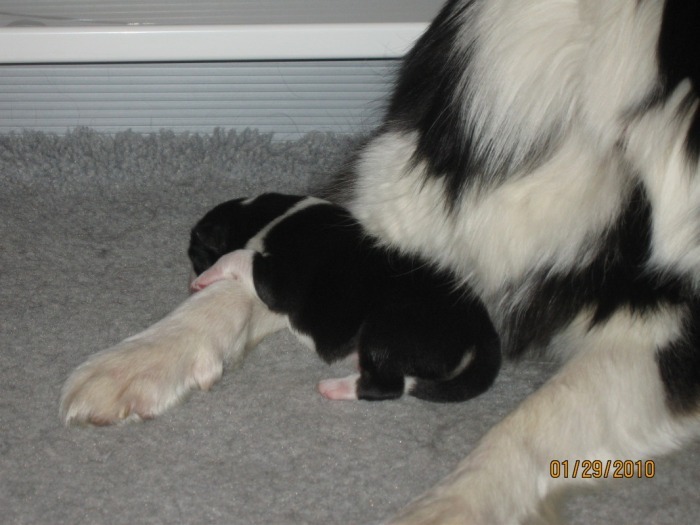 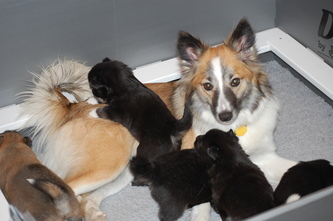 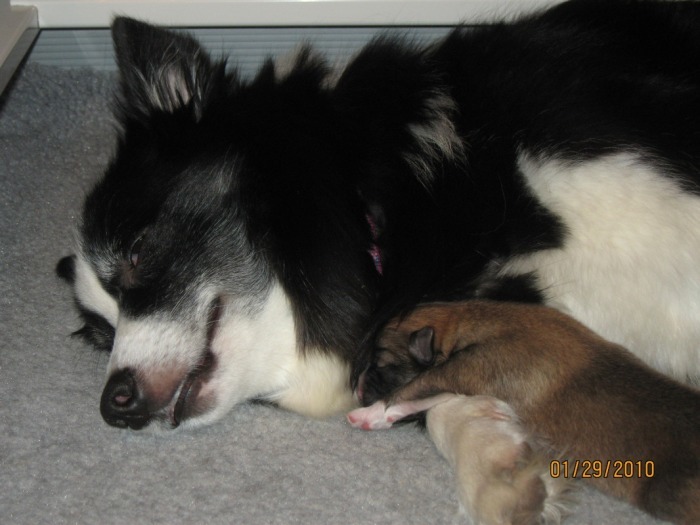 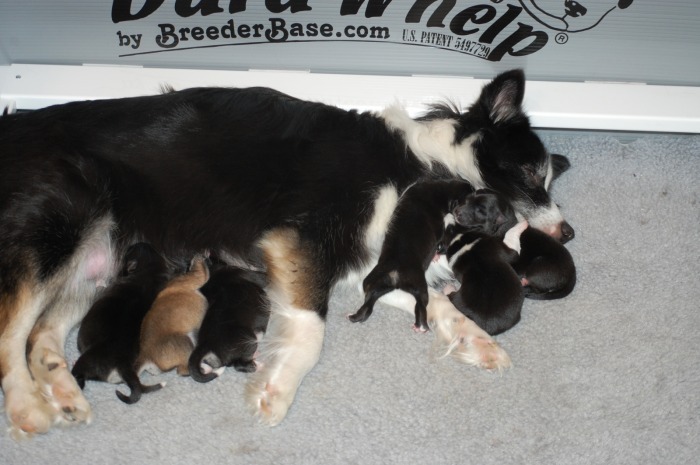 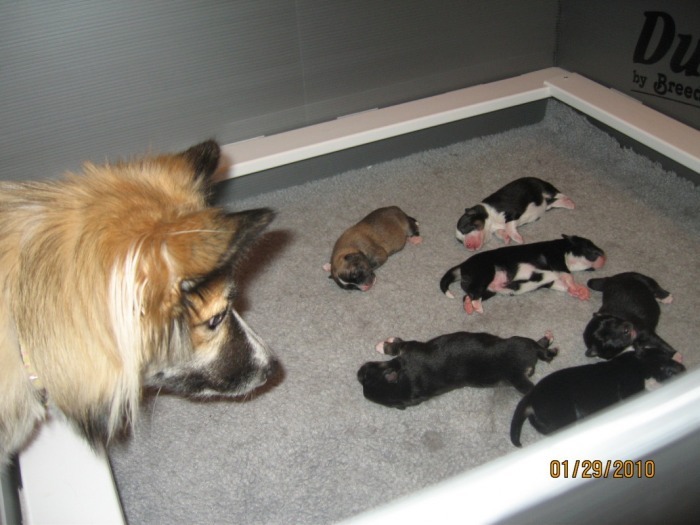 Meyla had her puppies this morning, right on her due date. 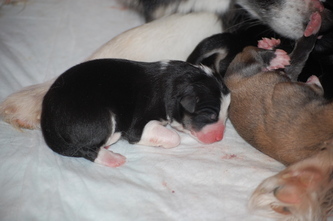 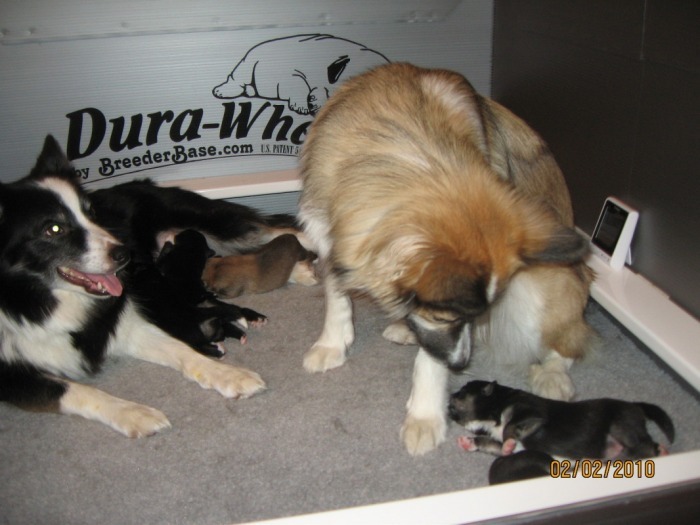 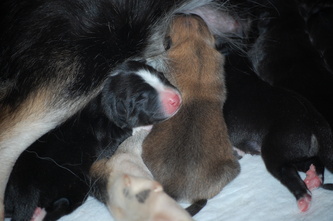 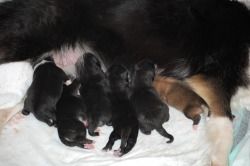 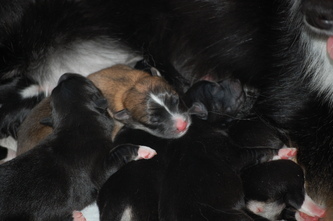 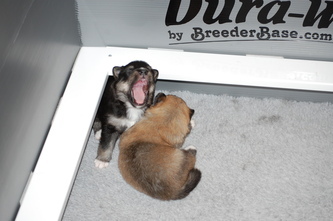 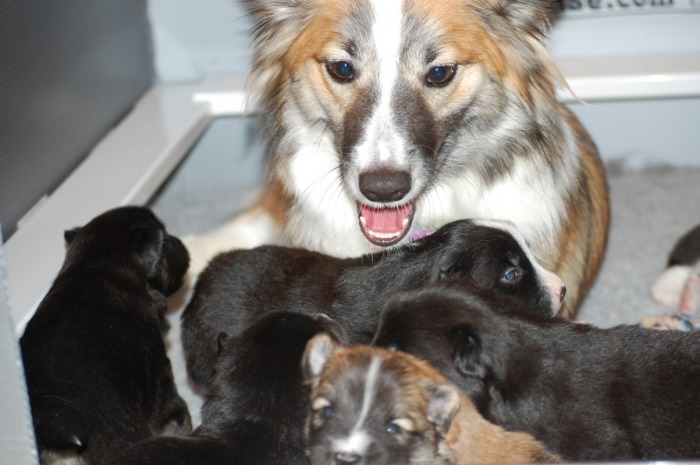 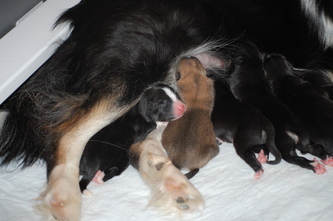 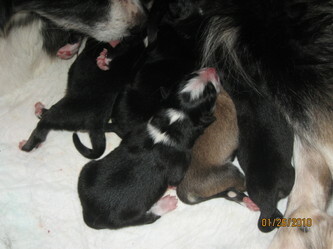 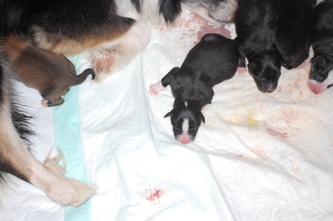 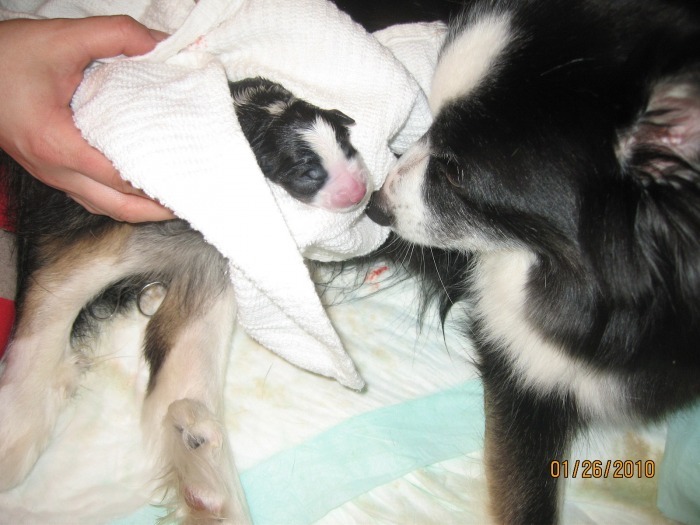 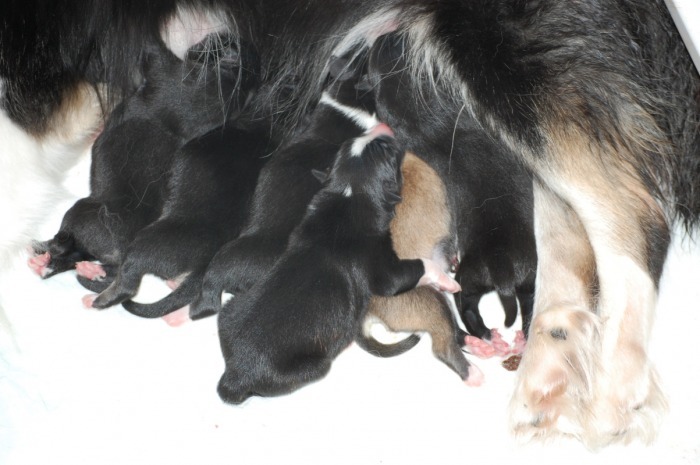 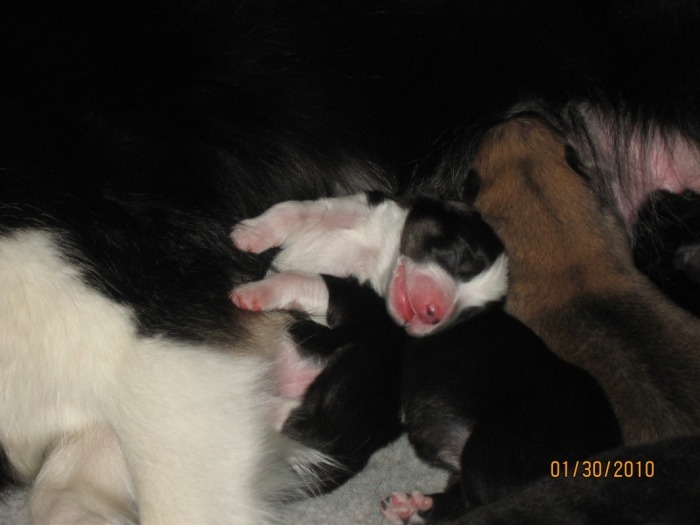 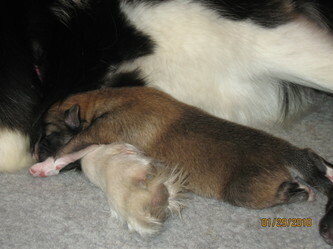 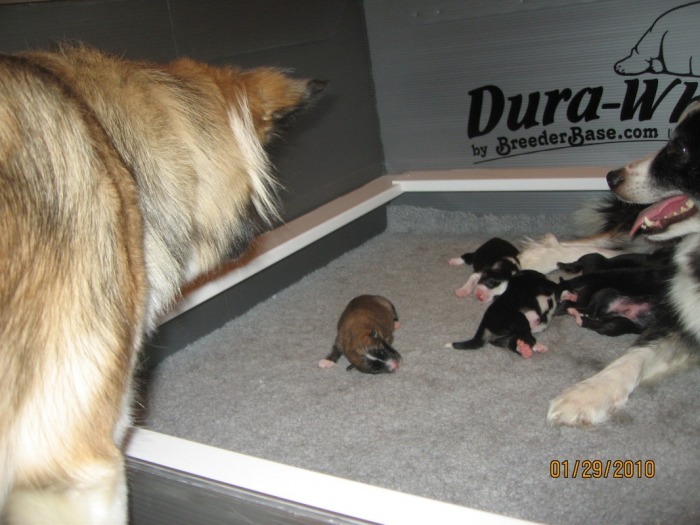 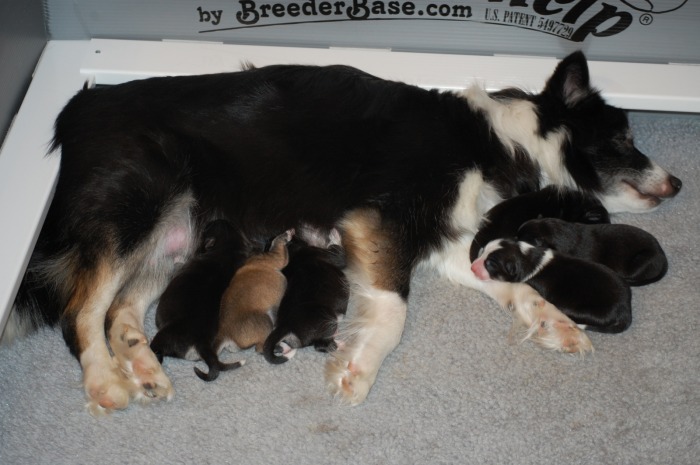 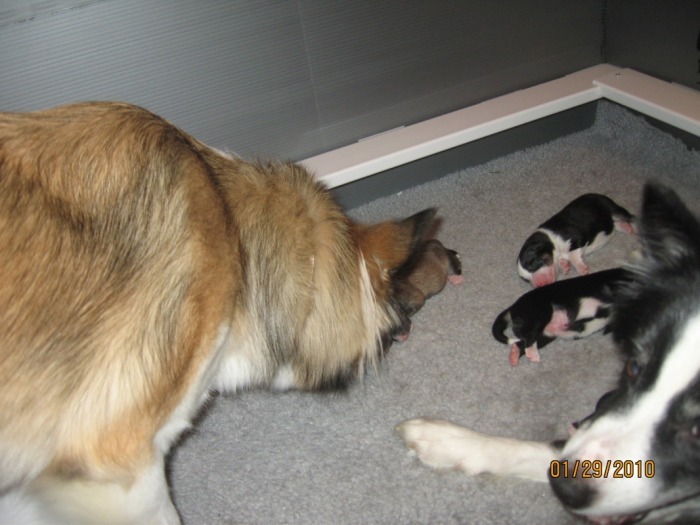 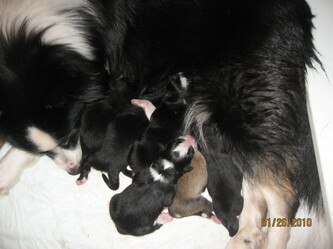 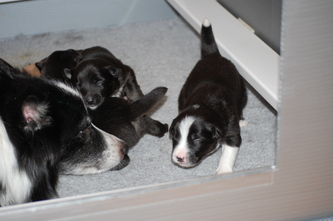 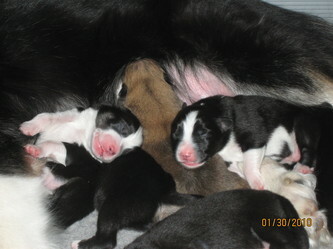 The puppies were born this morning starting at 3:16 and finishing at 5:24. 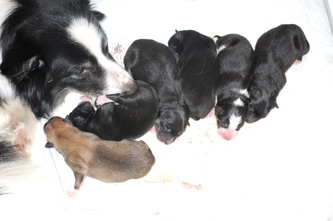 She had a female, female, male, male, male and a final male. 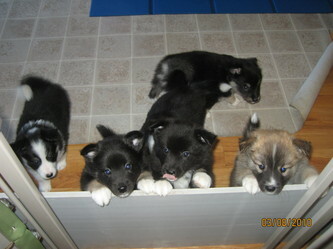 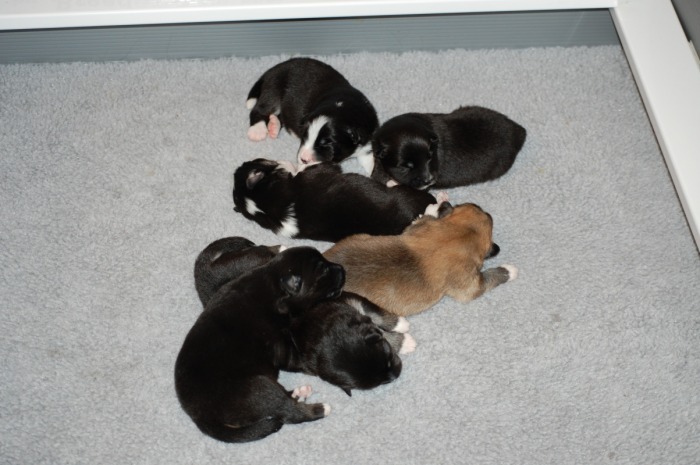 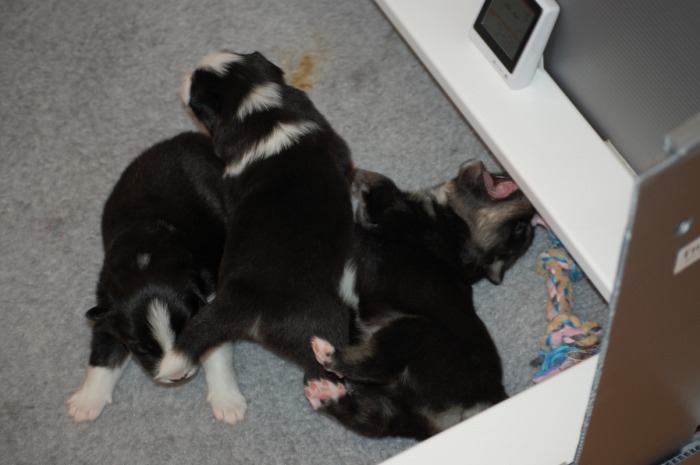 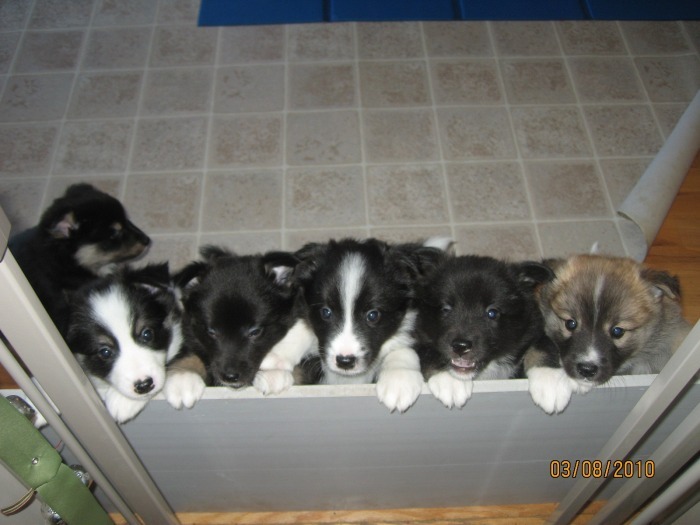 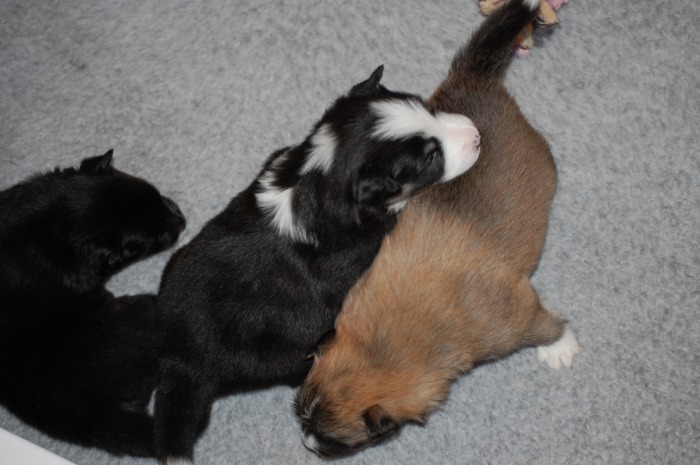 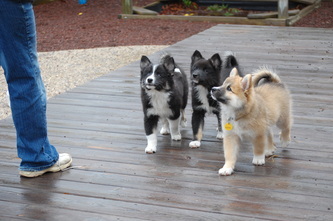 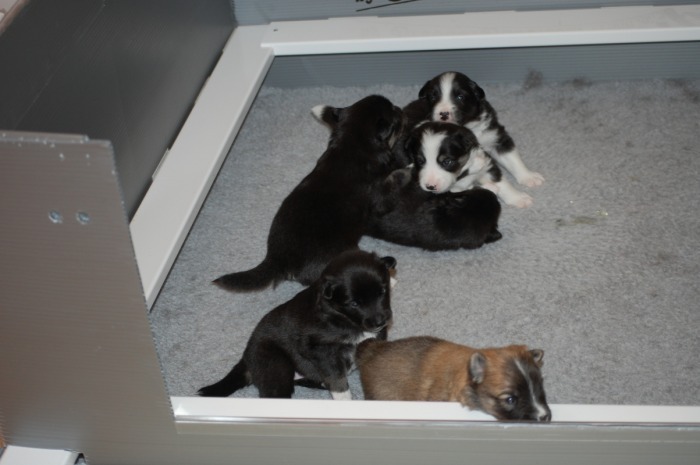 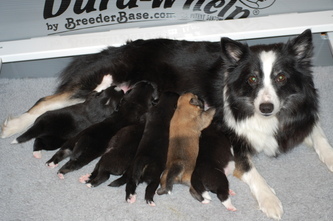 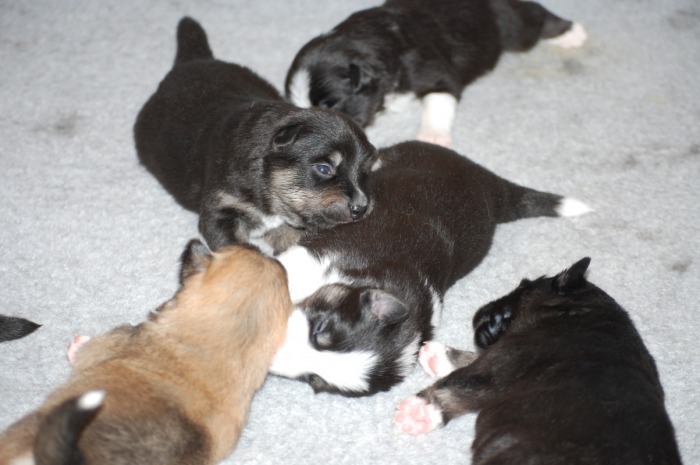 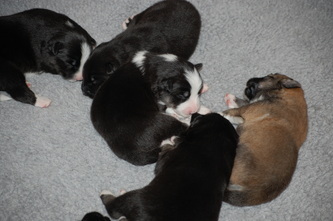 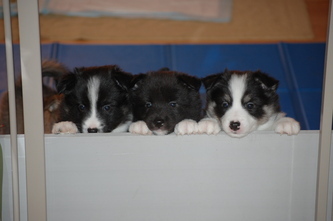 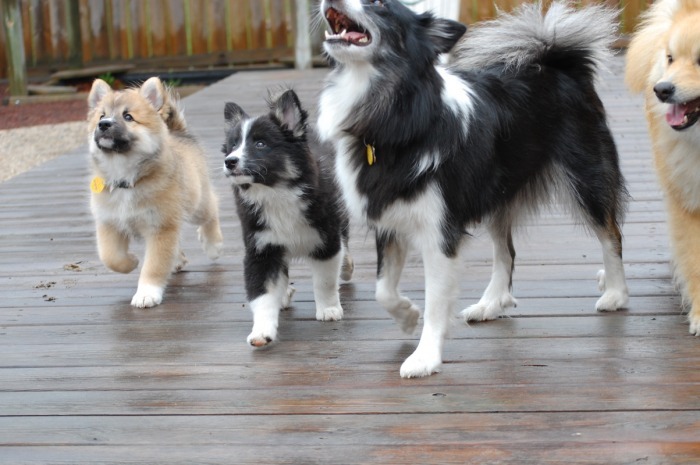 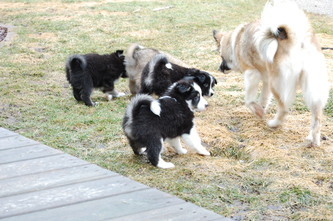 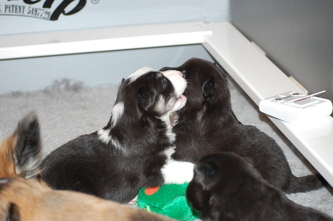 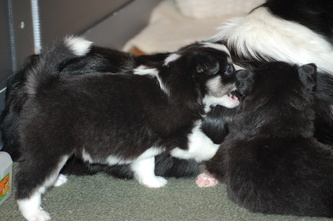 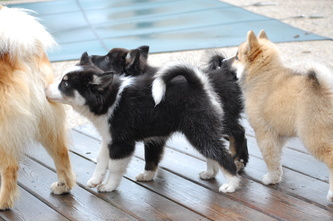 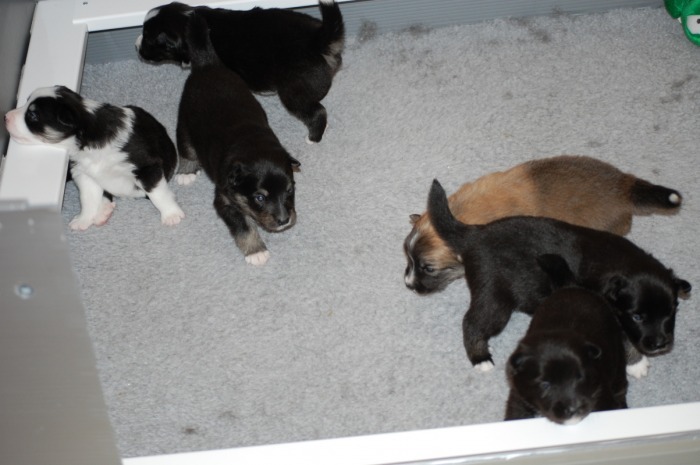 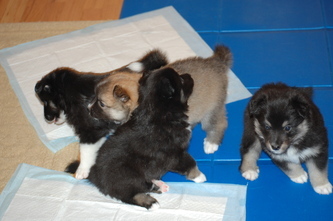 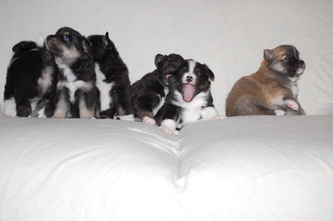 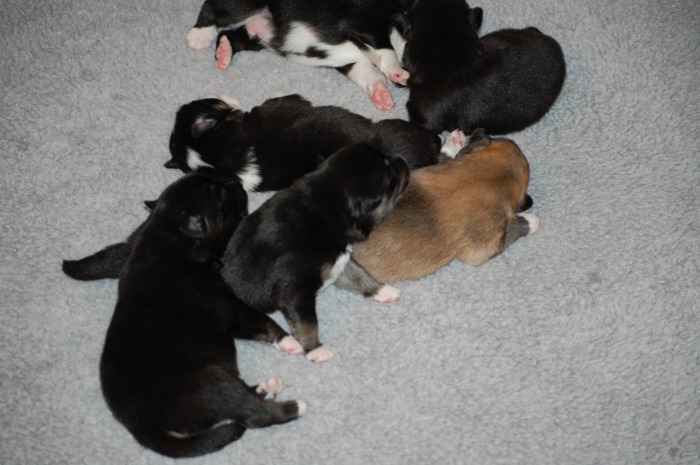 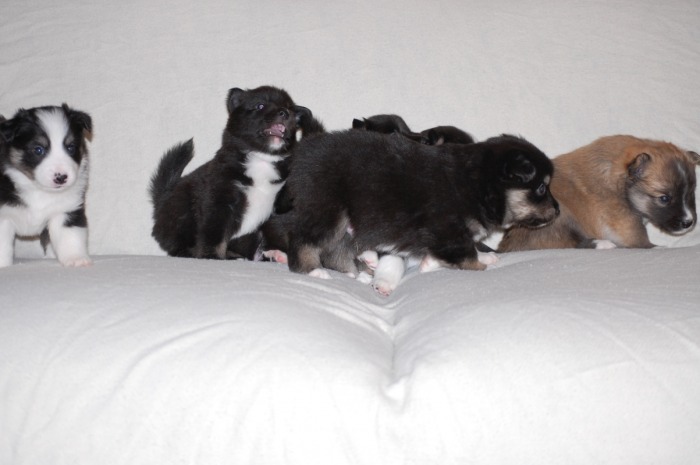 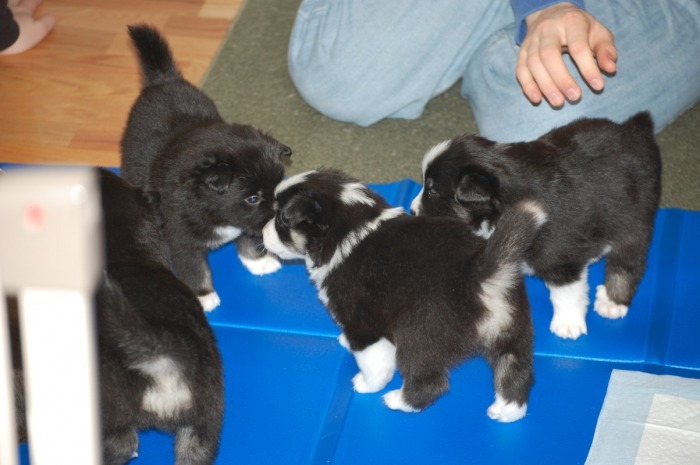 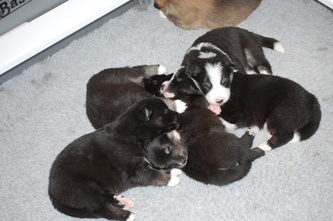 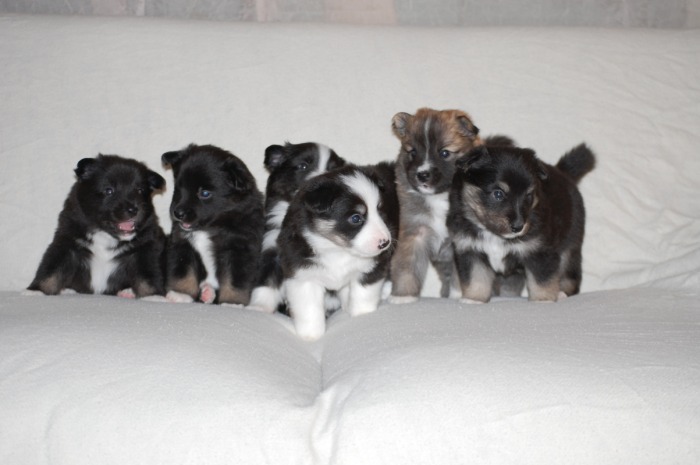 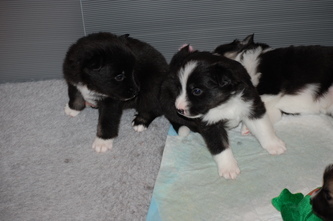 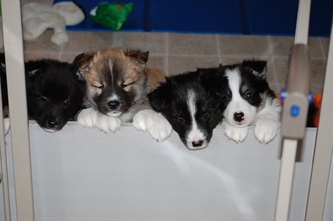 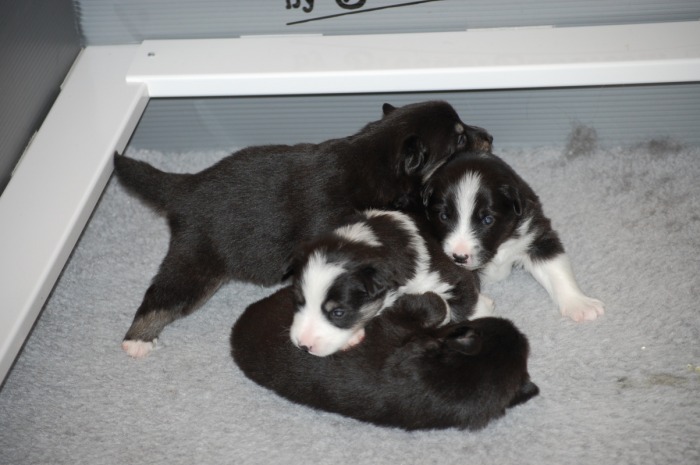 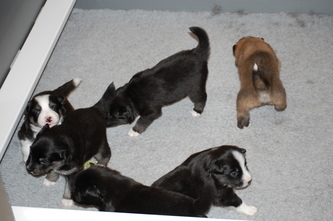 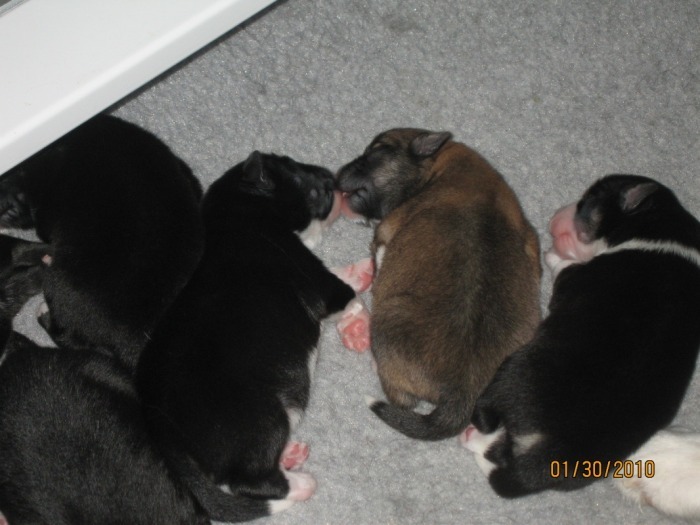 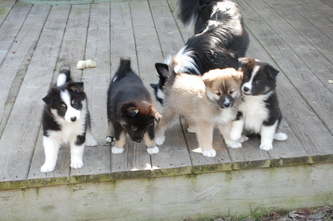 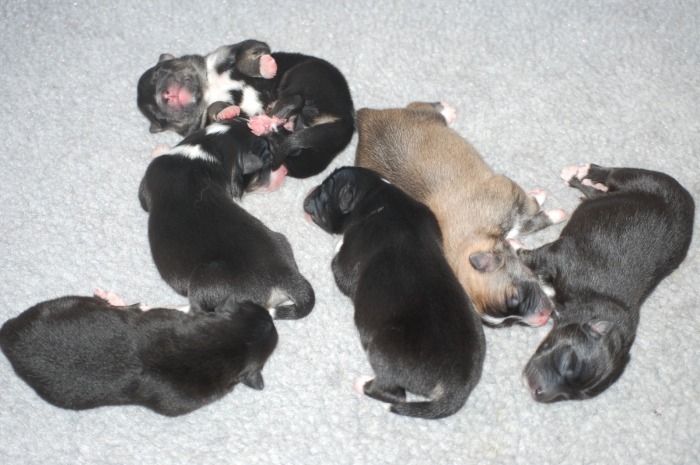 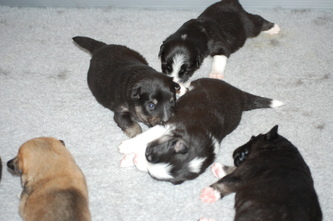 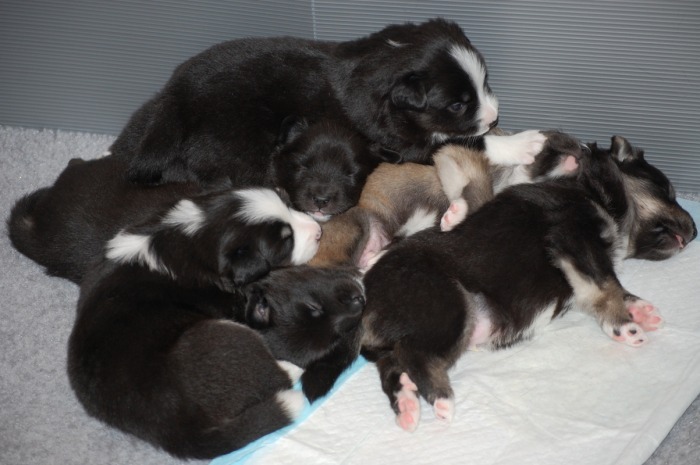 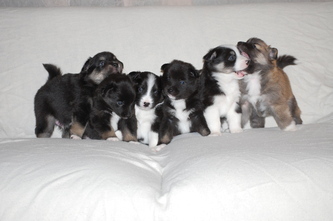 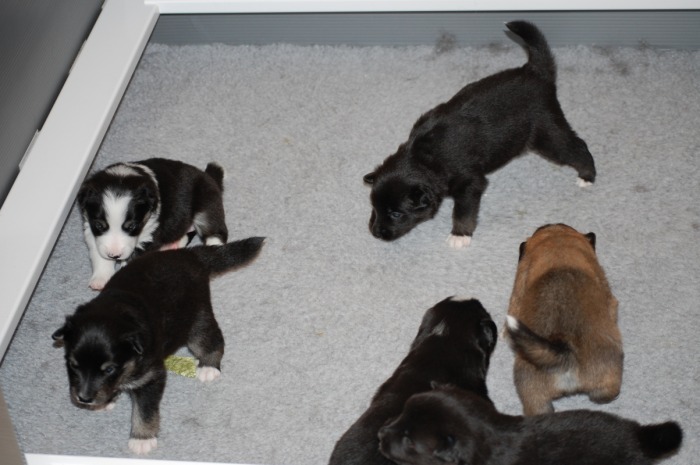 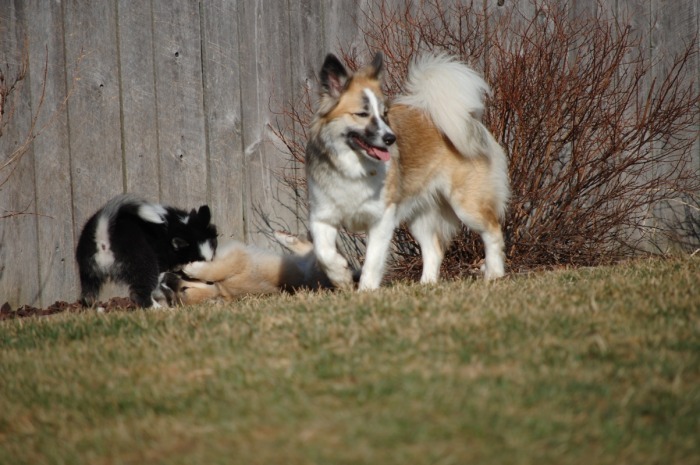 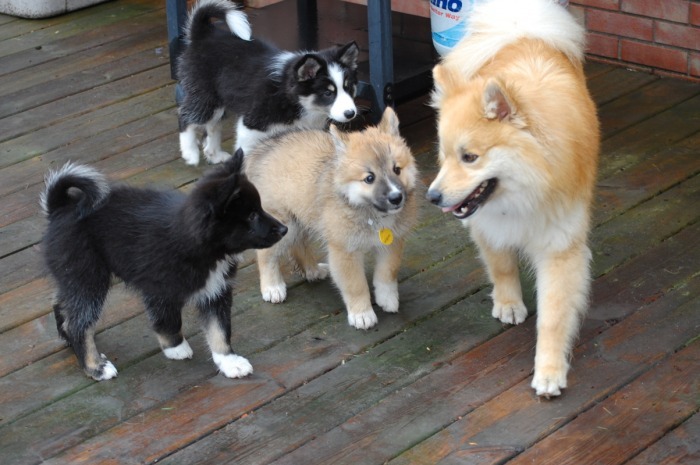 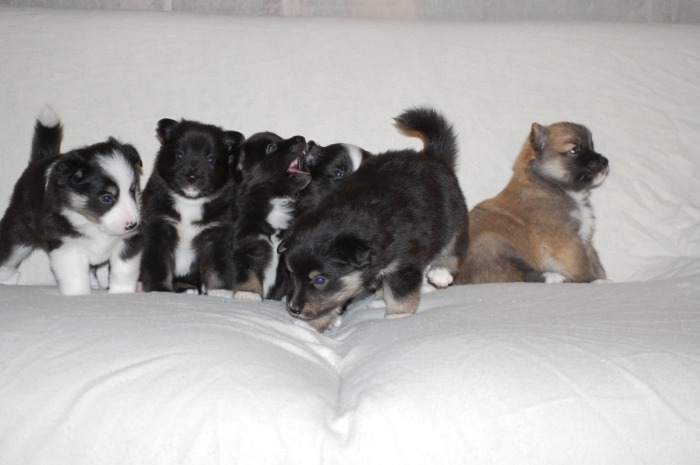 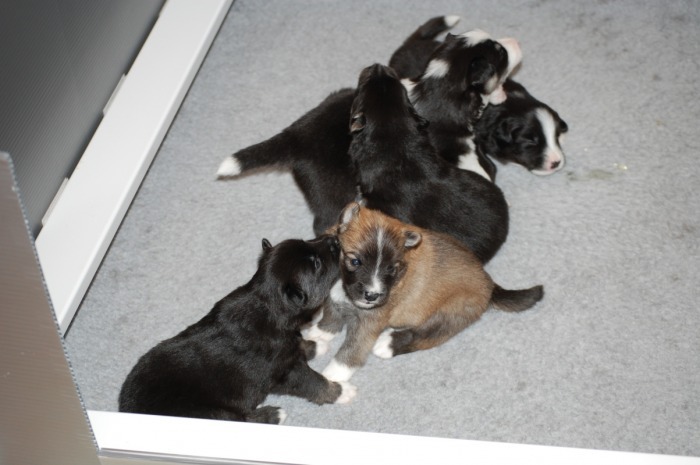 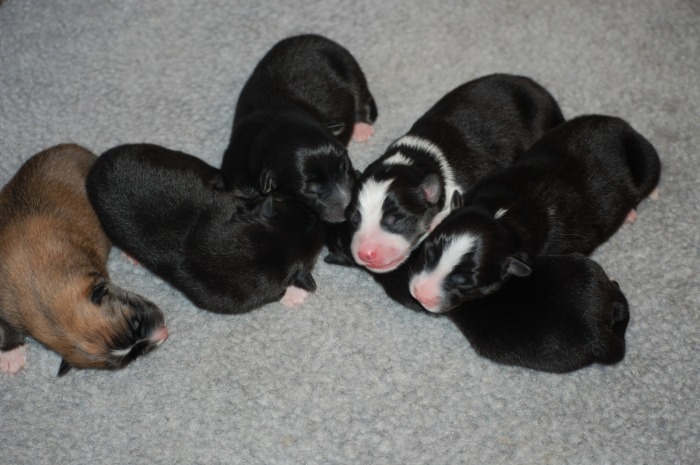 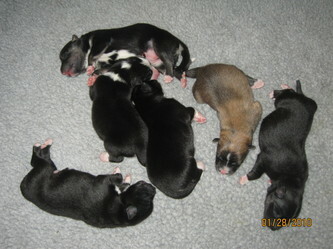 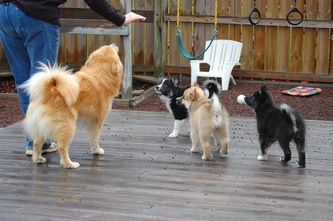 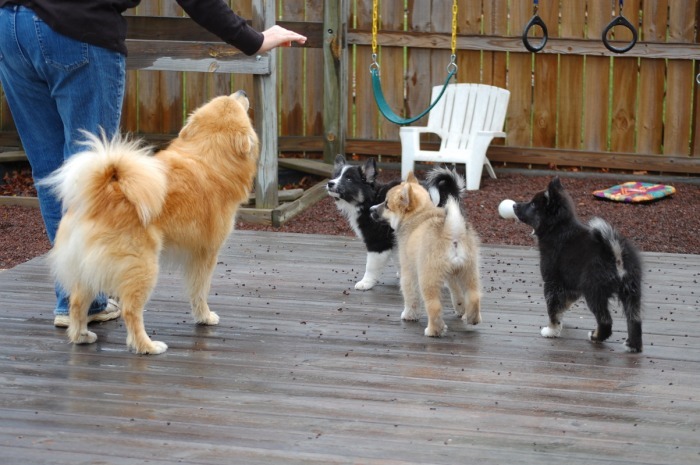 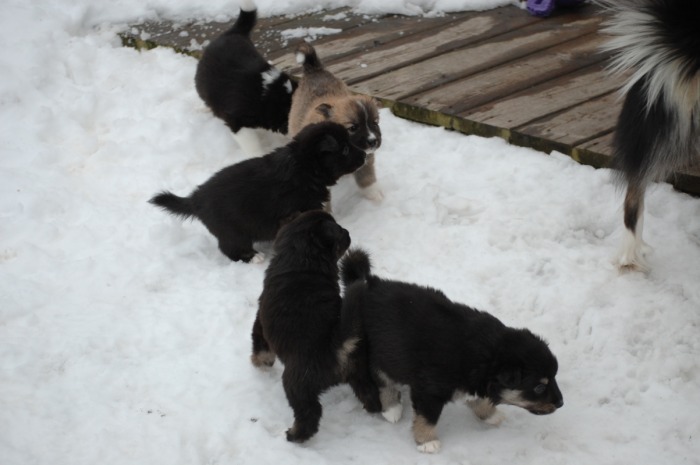 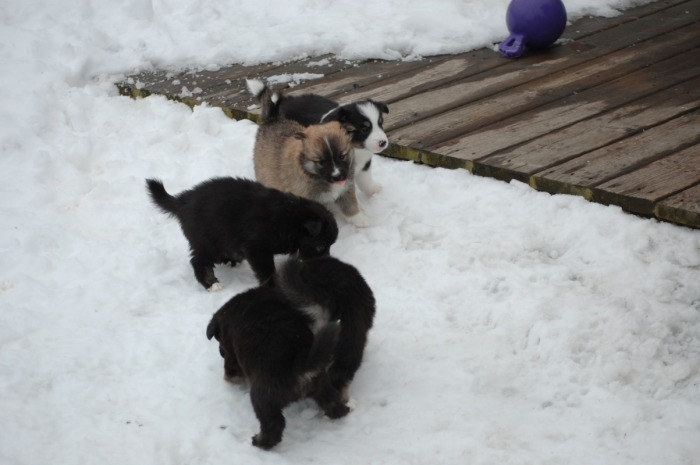 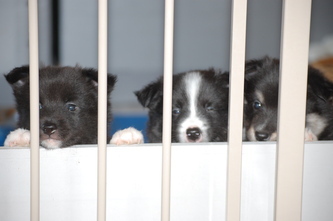 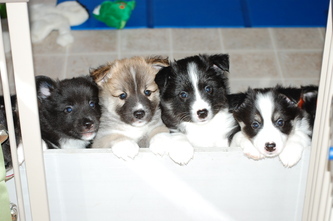 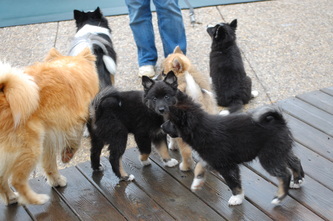 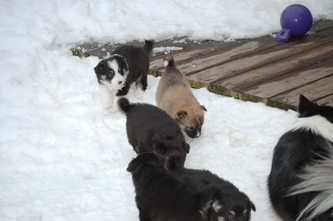 Five are black tri's and the one tan is a male. 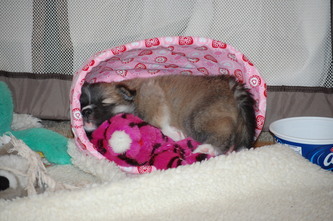 Puppies should have a due date of Jan. 27, 2010!!!!! 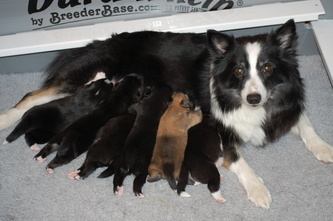 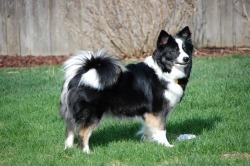 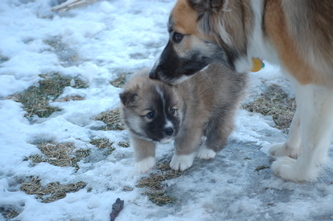 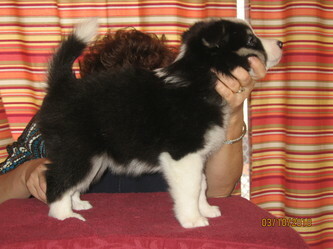 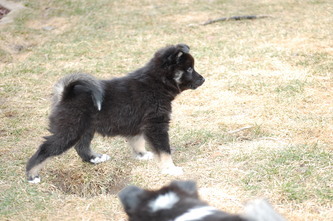 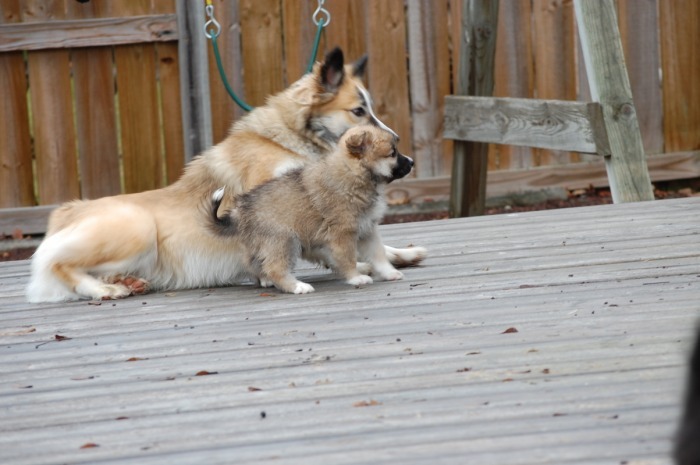 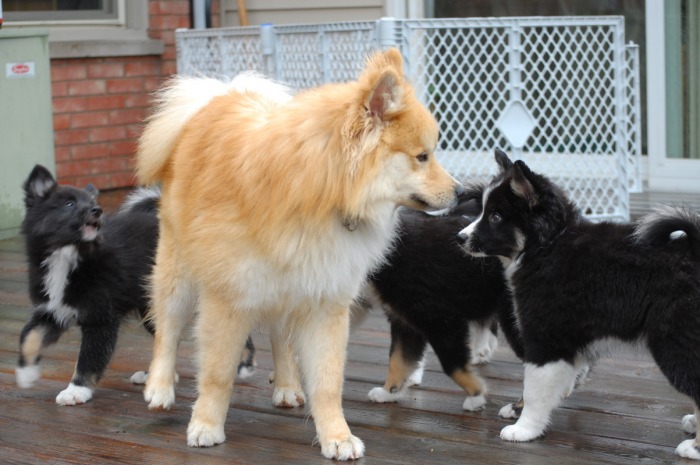 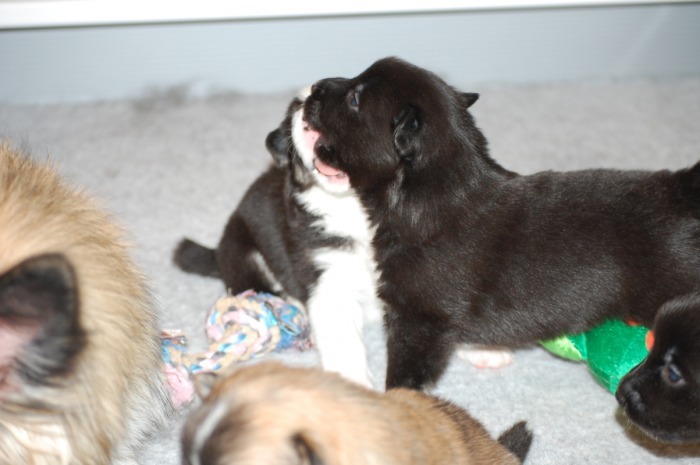 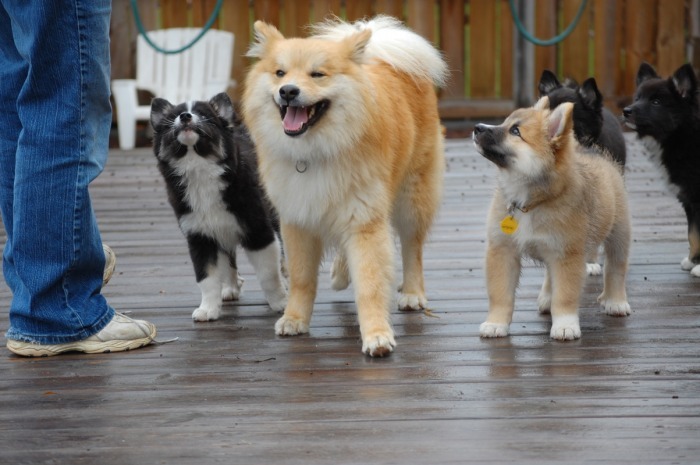 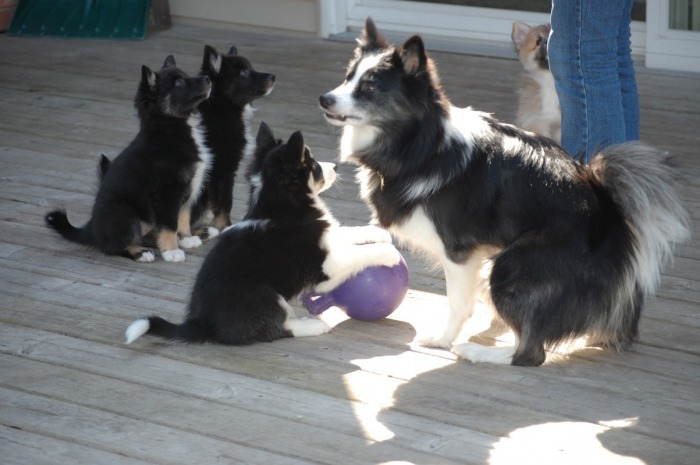 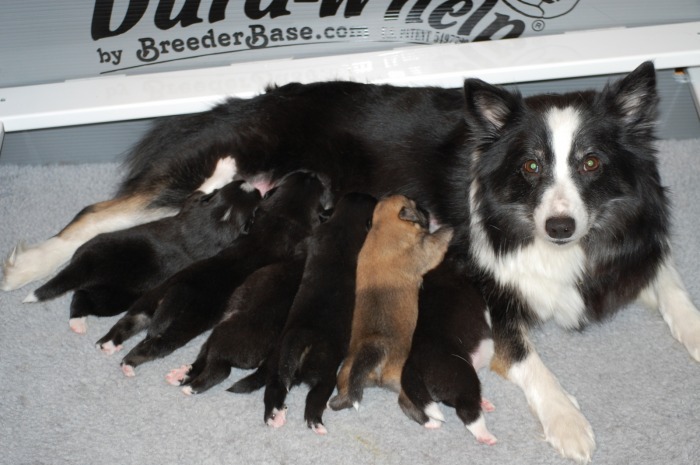 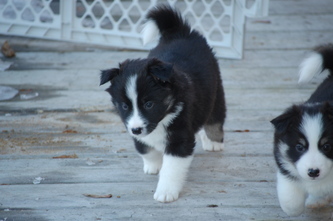 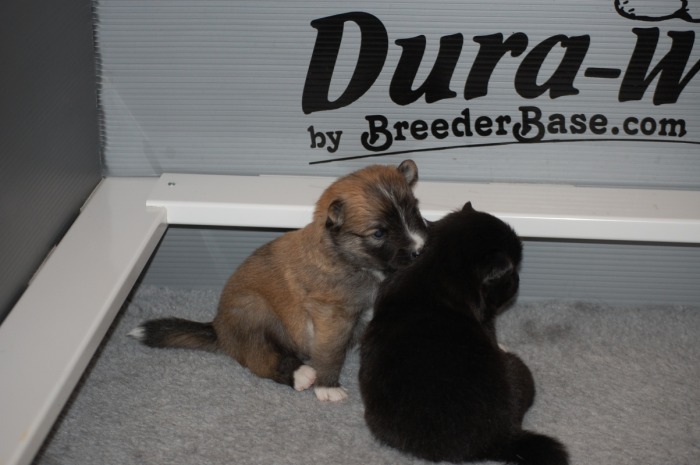 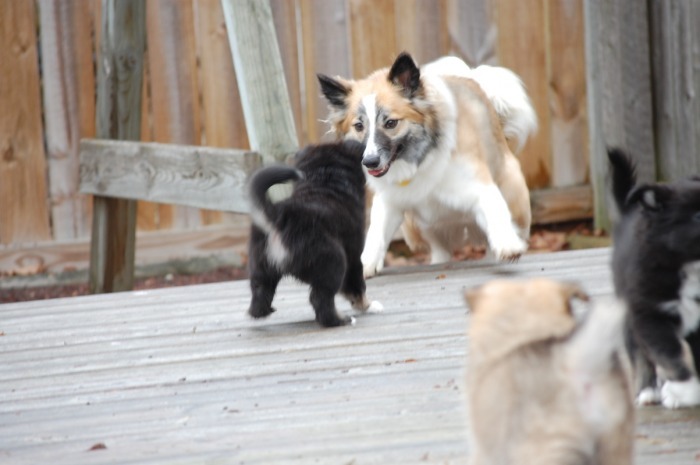 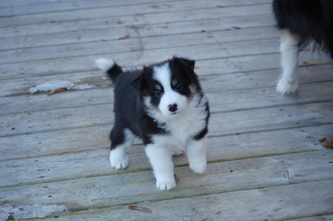 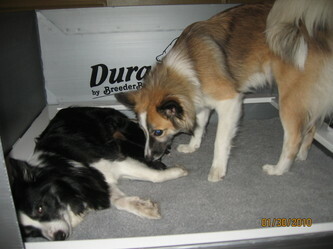 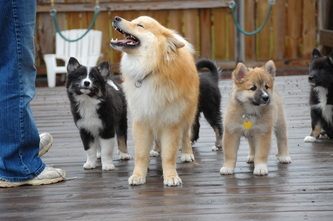 If all goes well, Meyla's next litter should be January 2010. 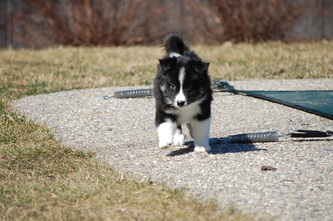 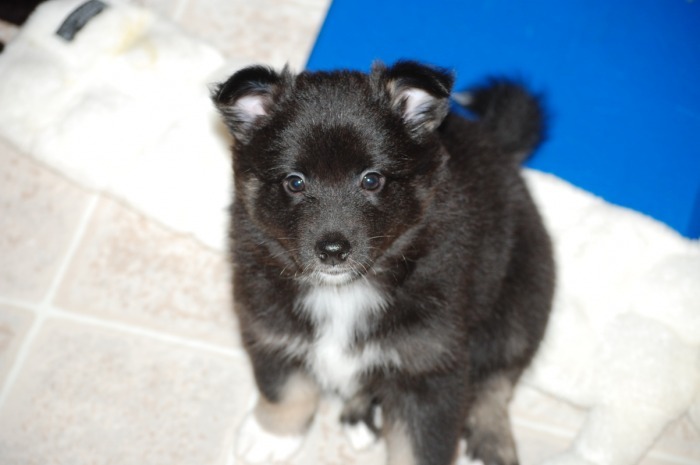 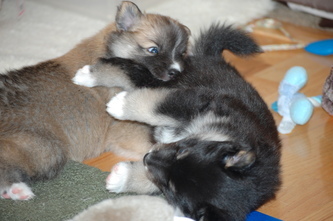 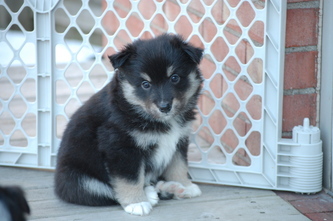 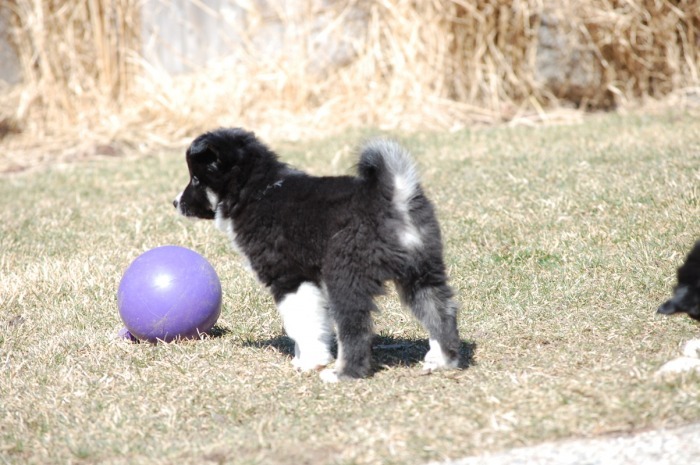 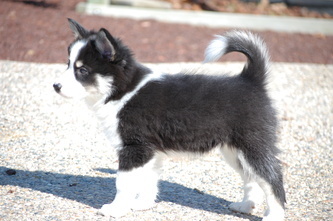 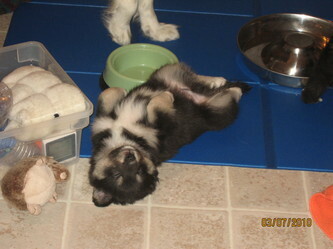 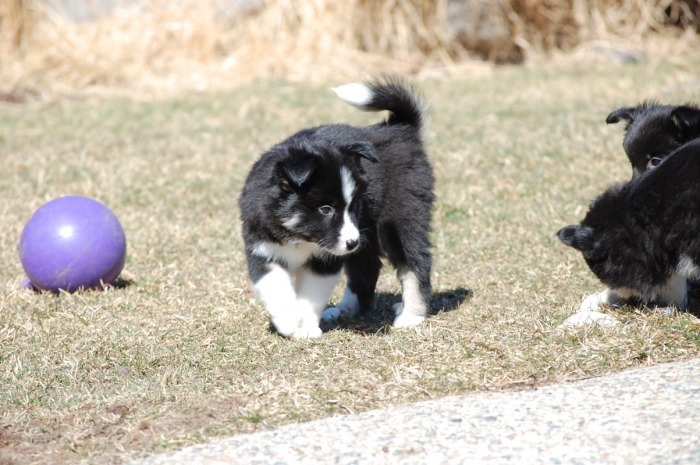 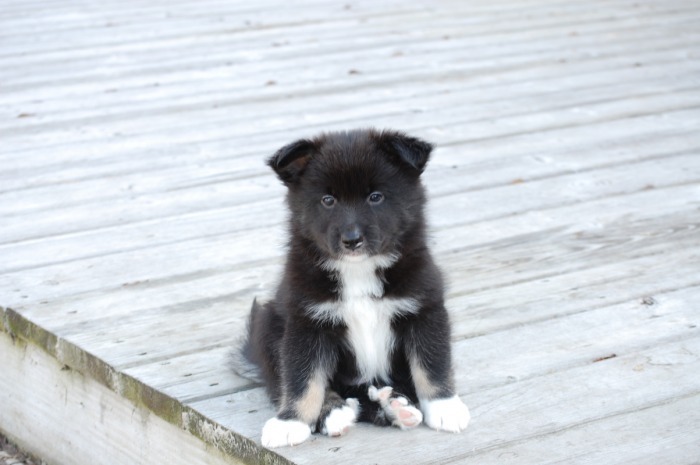 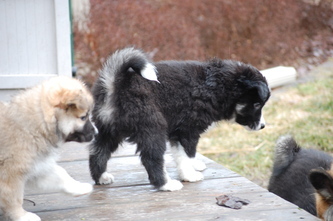 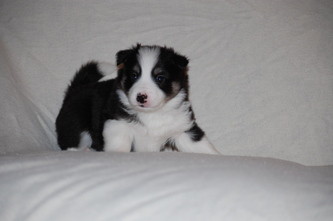 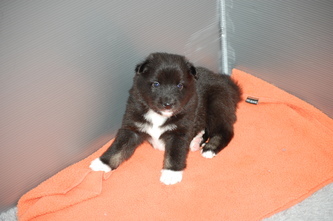 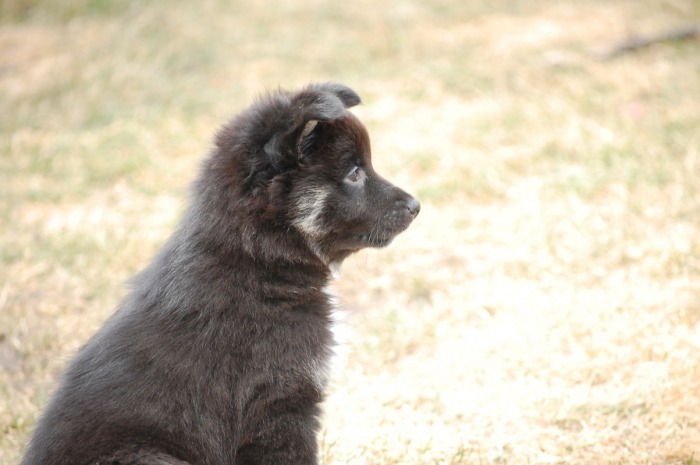 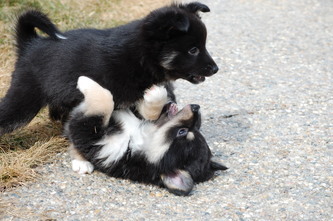 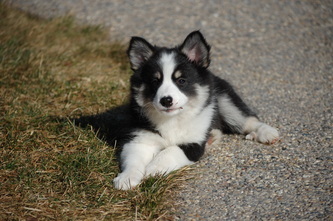 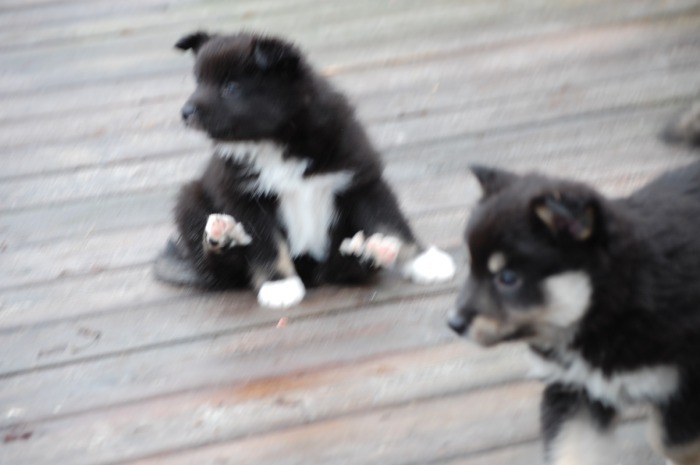 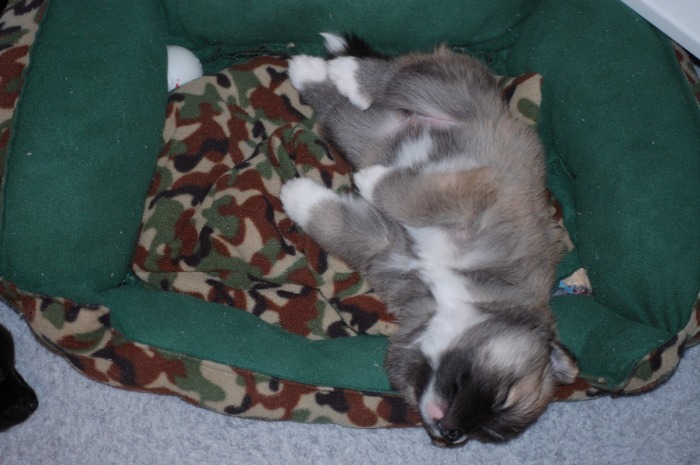 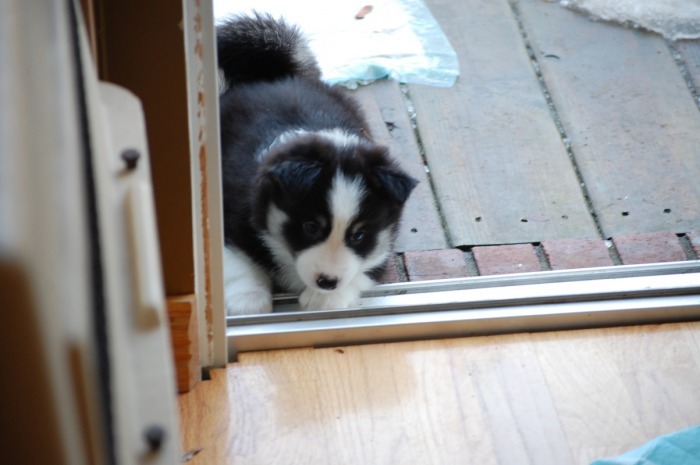 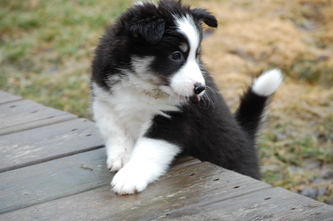 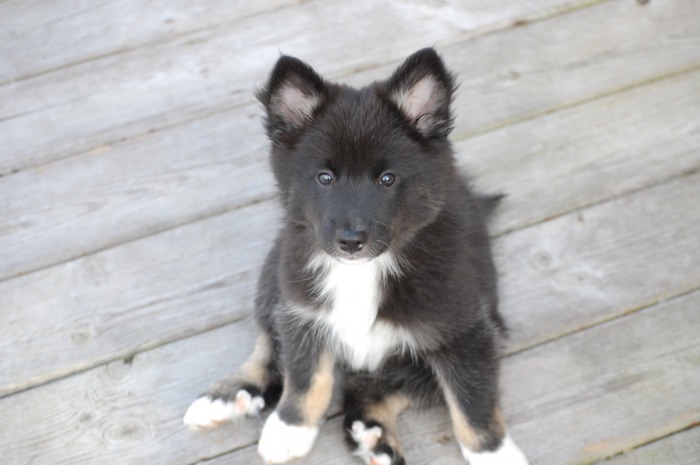 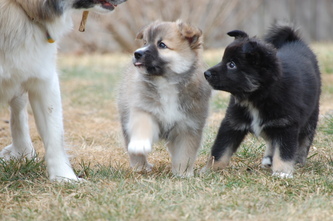 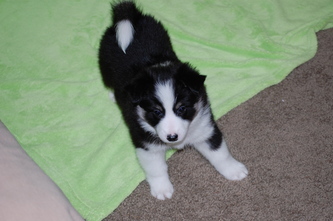 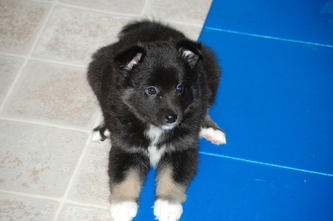 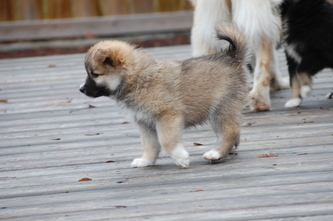 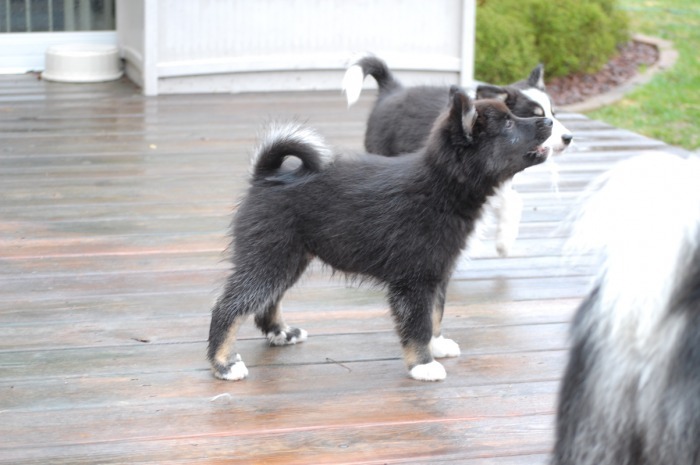 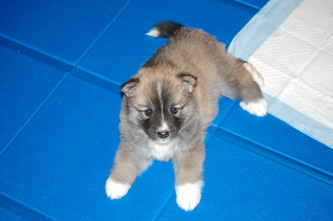 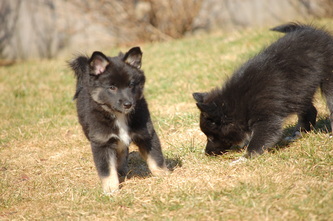 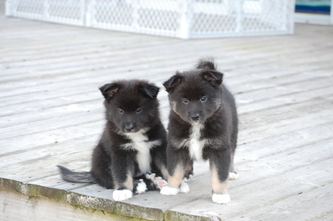 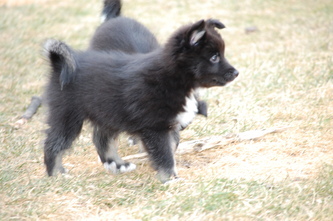 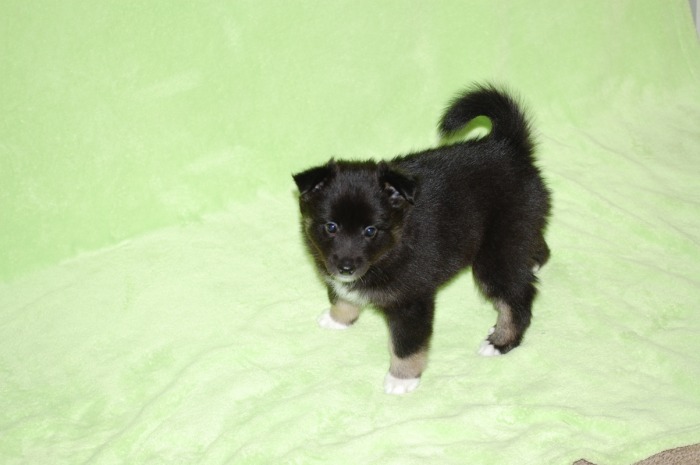 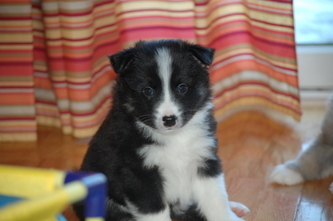 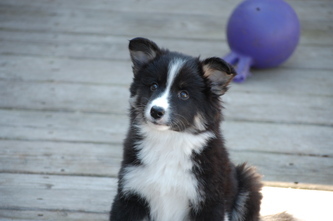 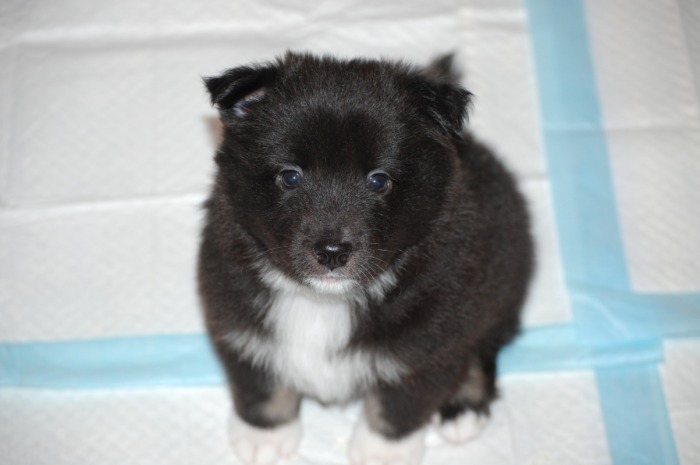 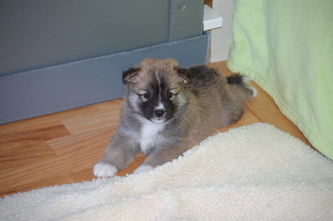 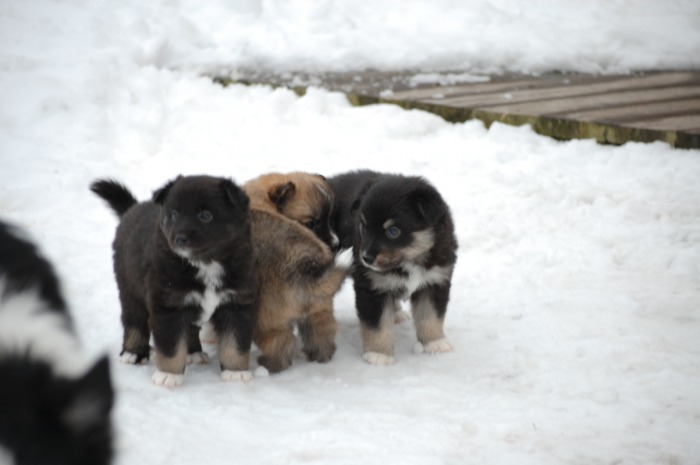 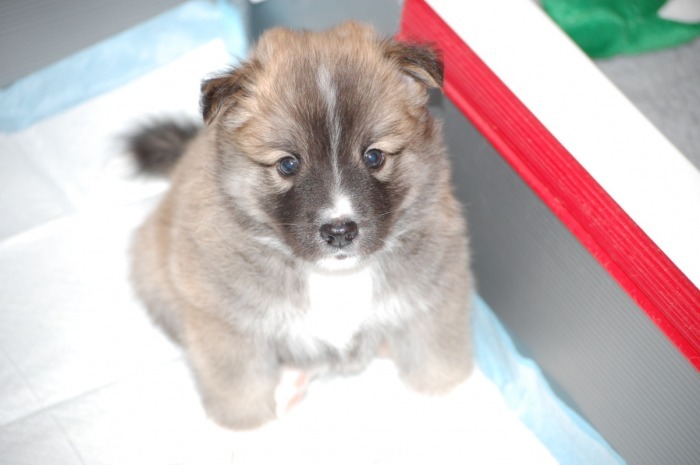 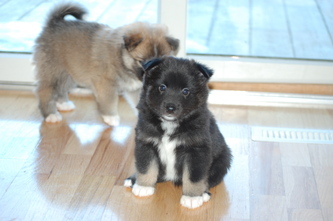 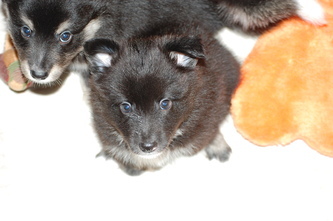 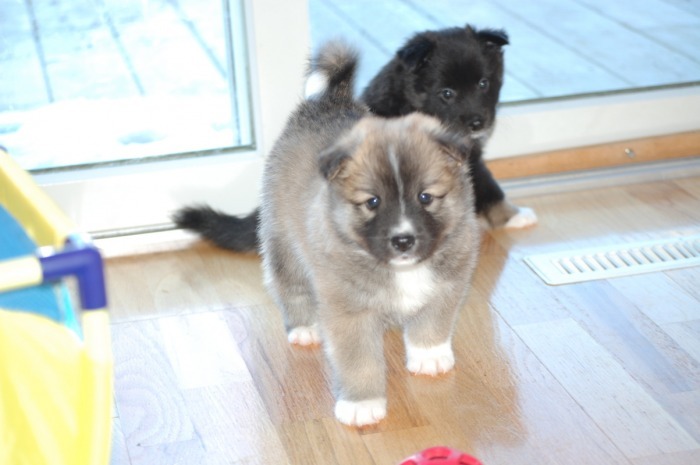 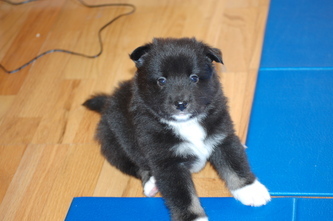 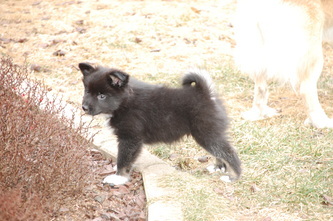 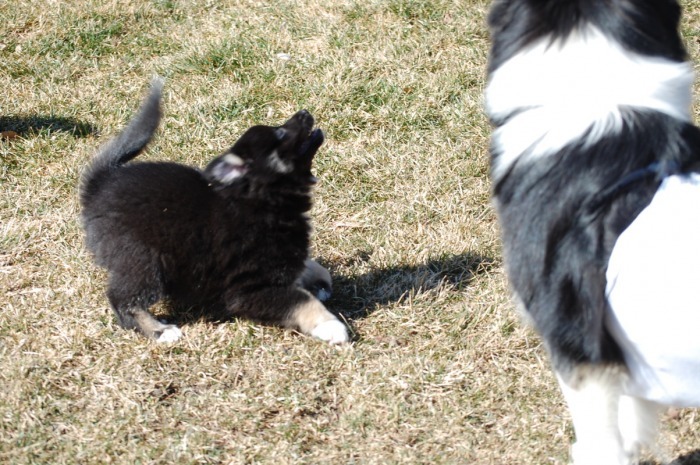 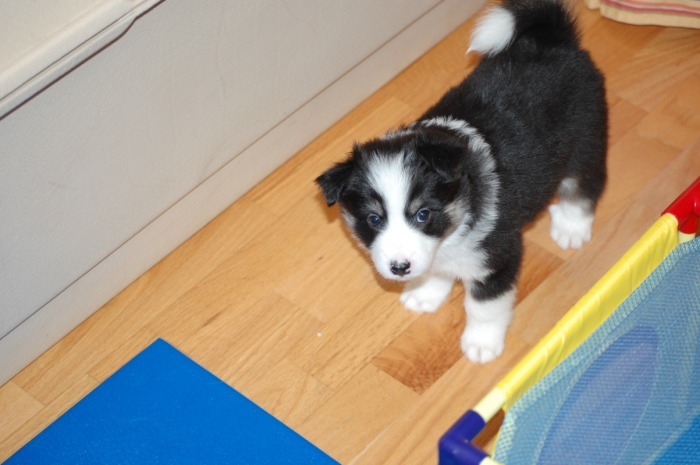 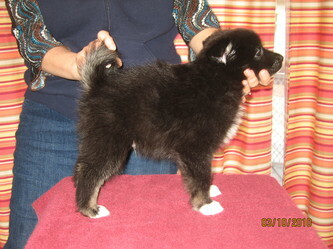 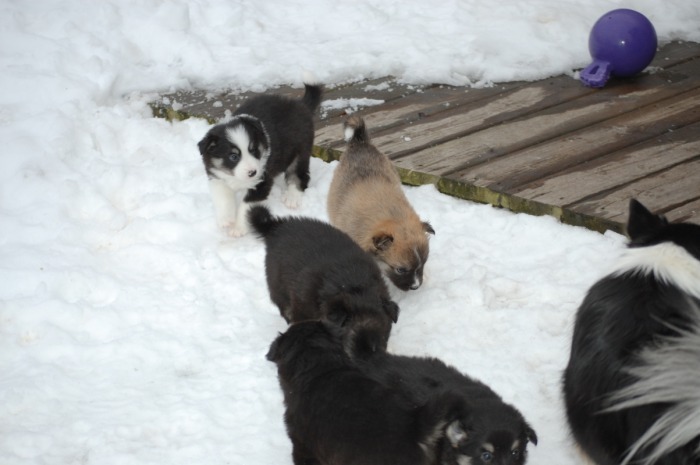 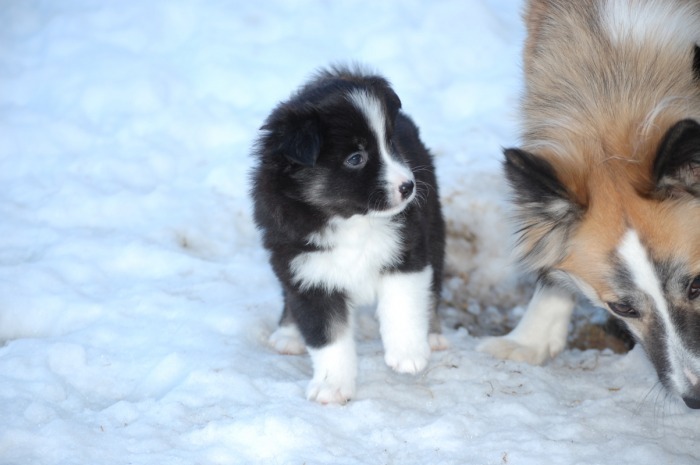 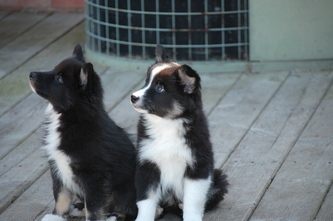 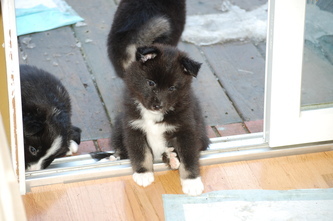 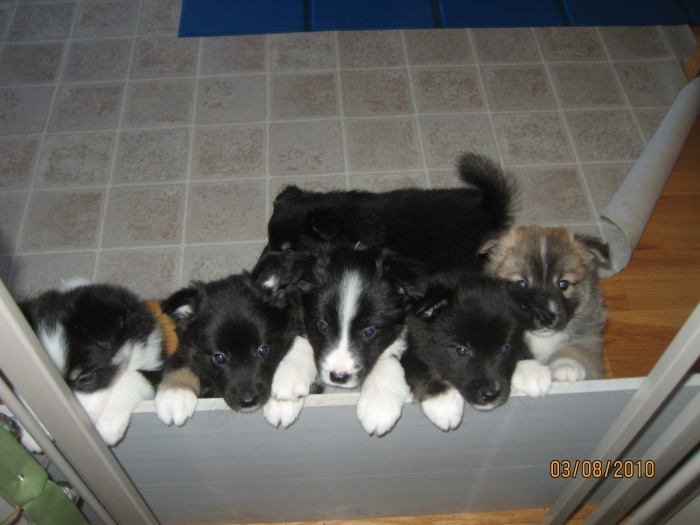 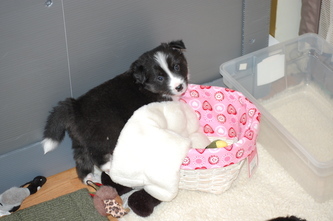 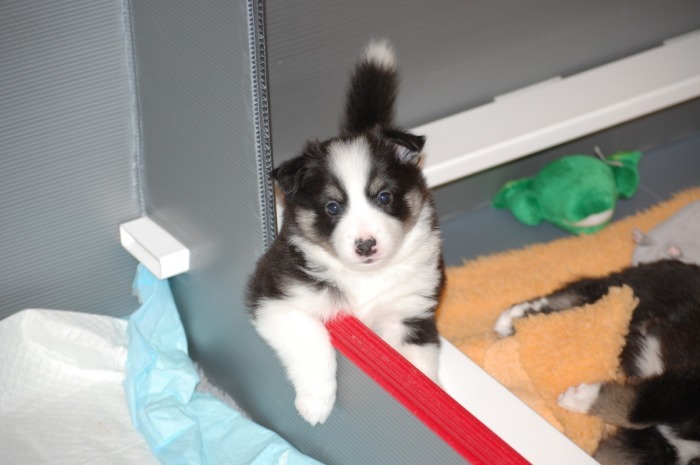 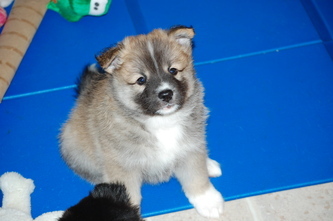 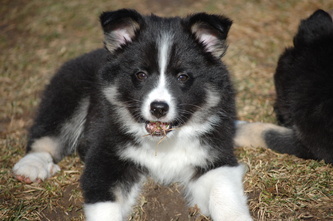 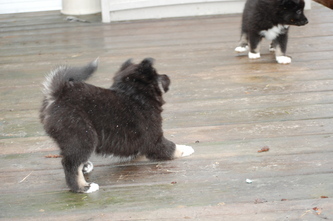 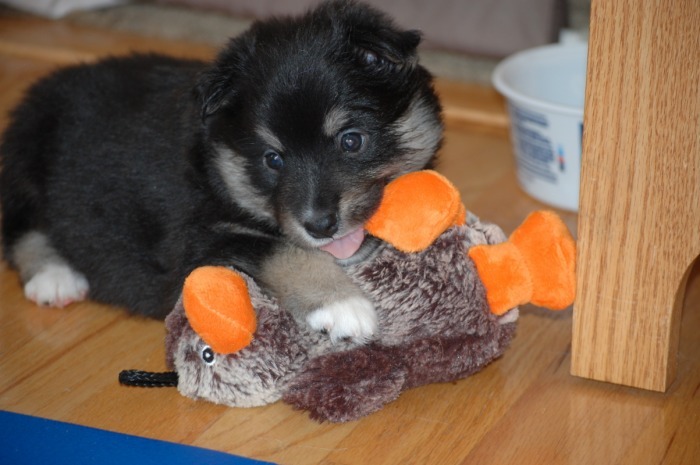 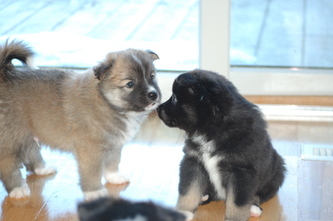 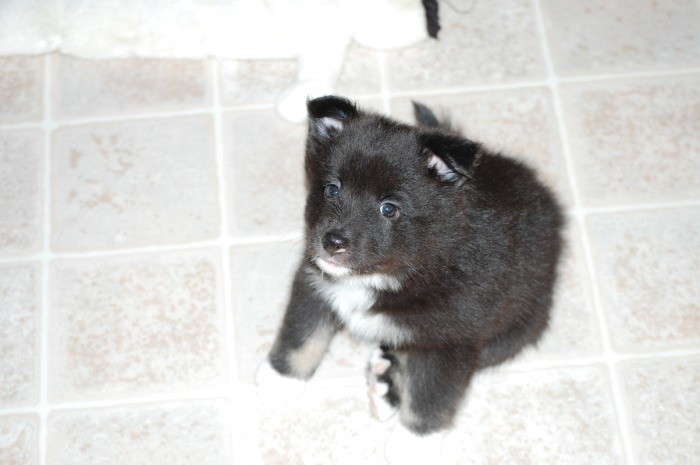 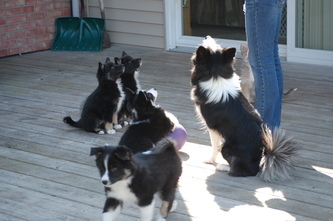 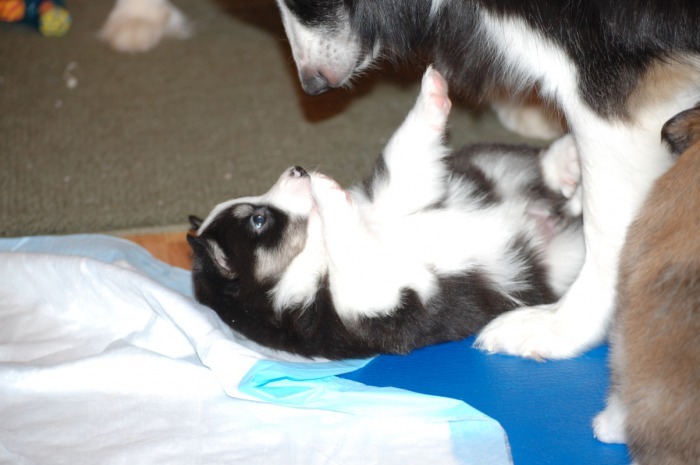 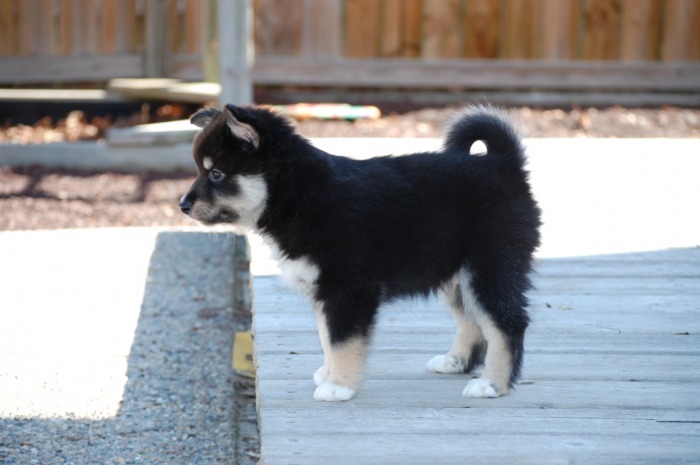 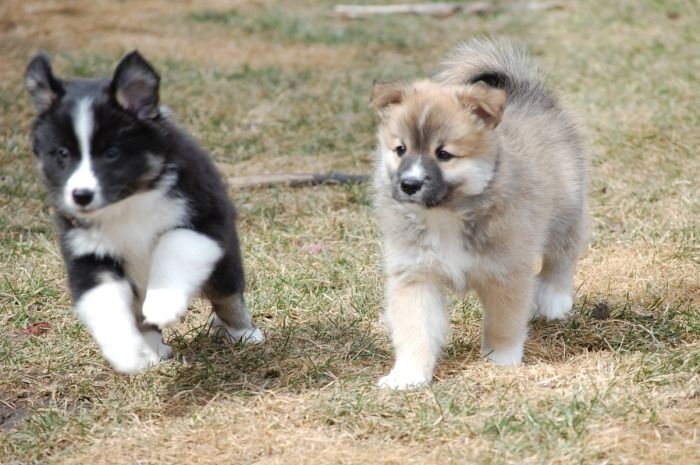 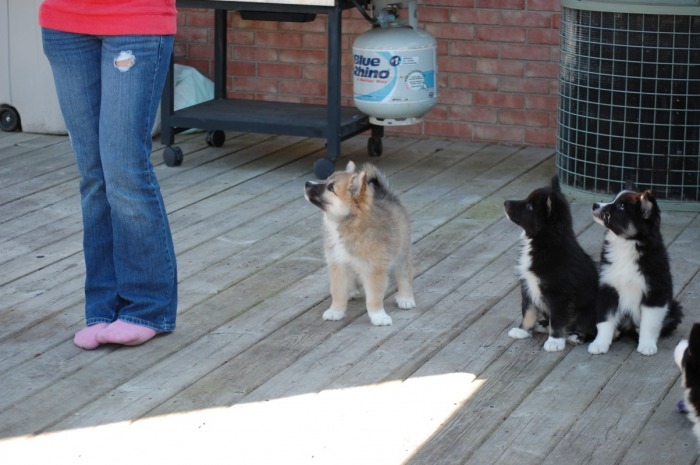 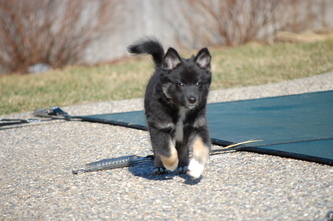 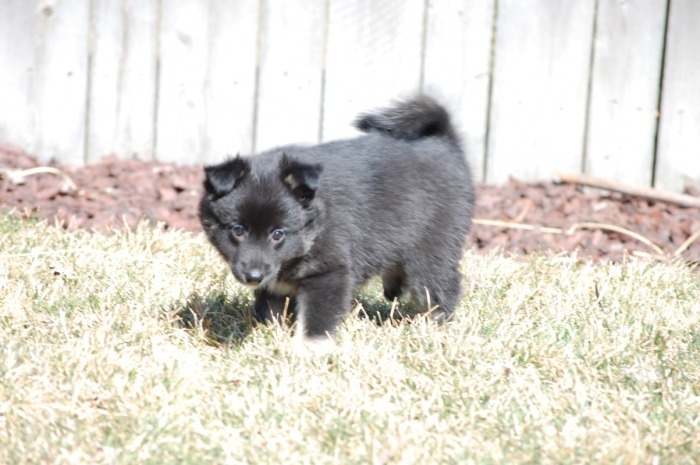 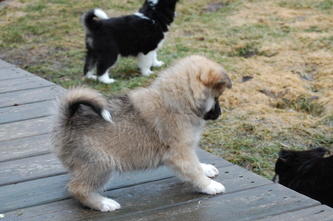 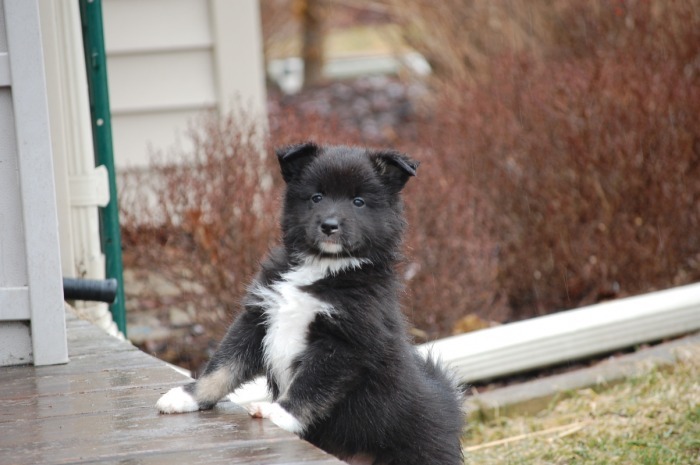 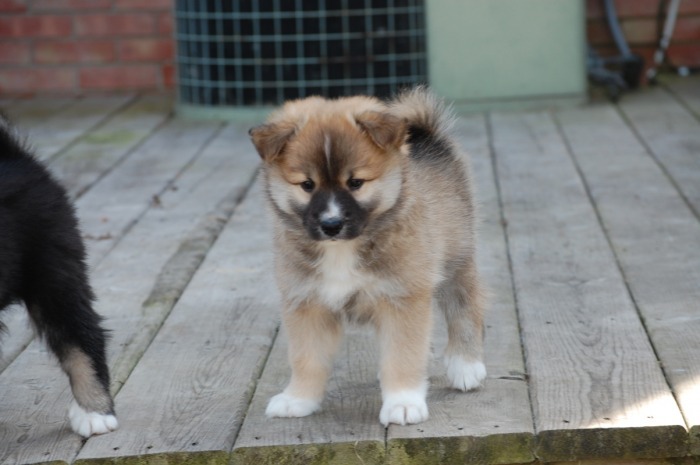 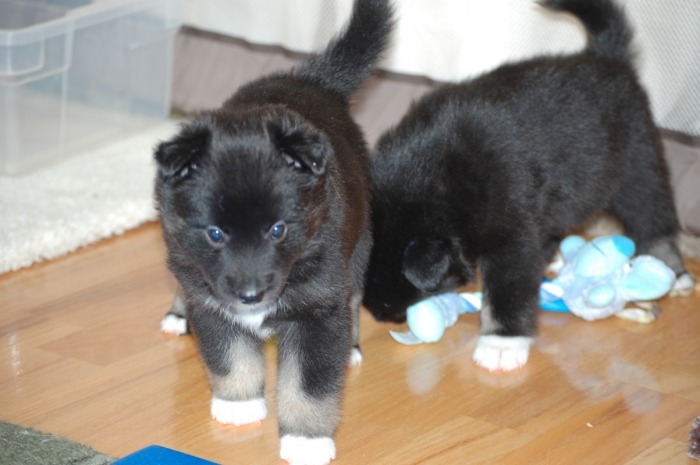 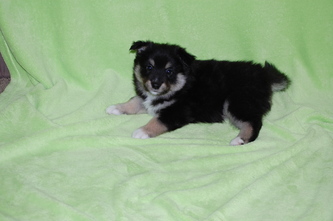 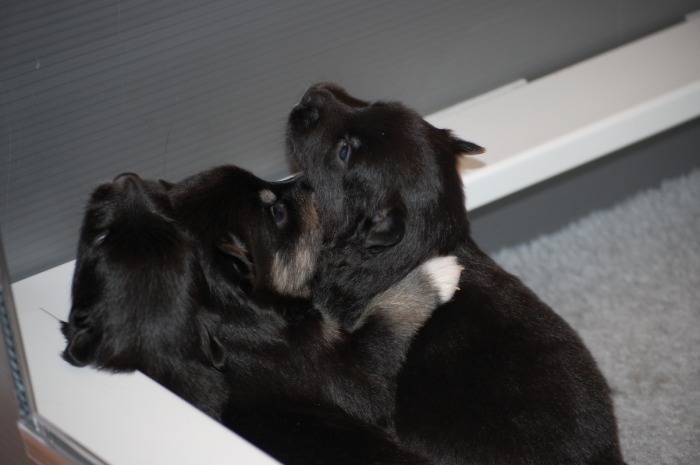 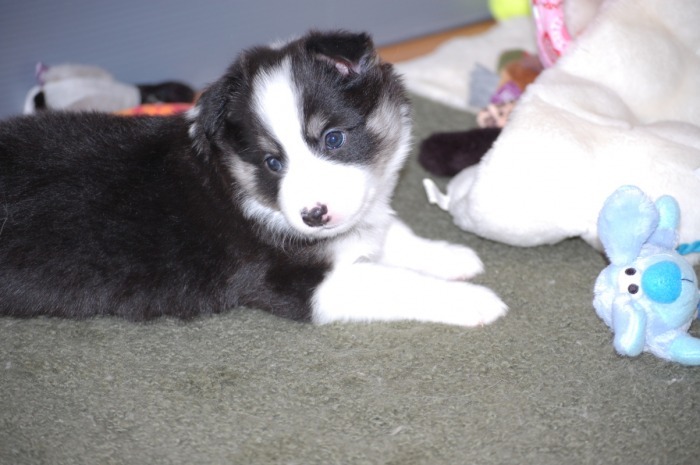 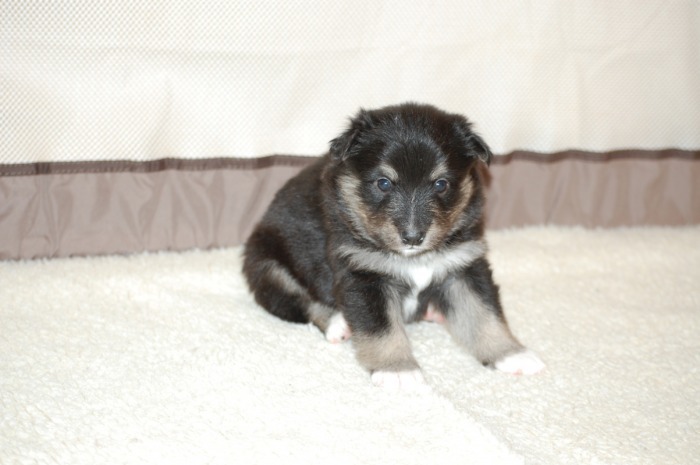 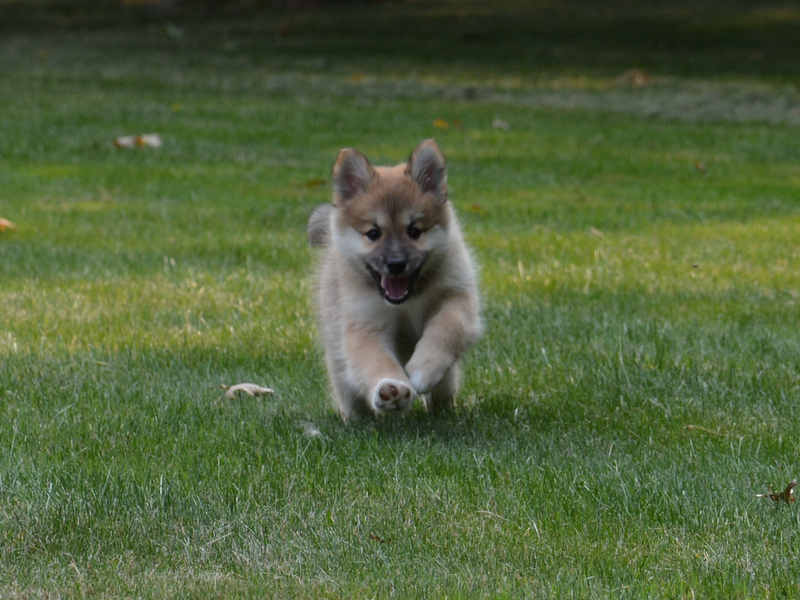 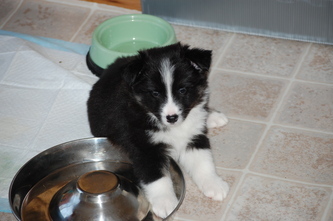 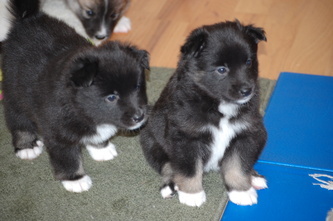 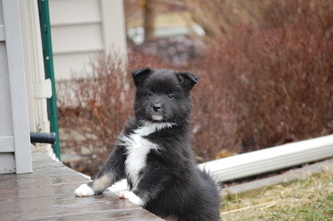 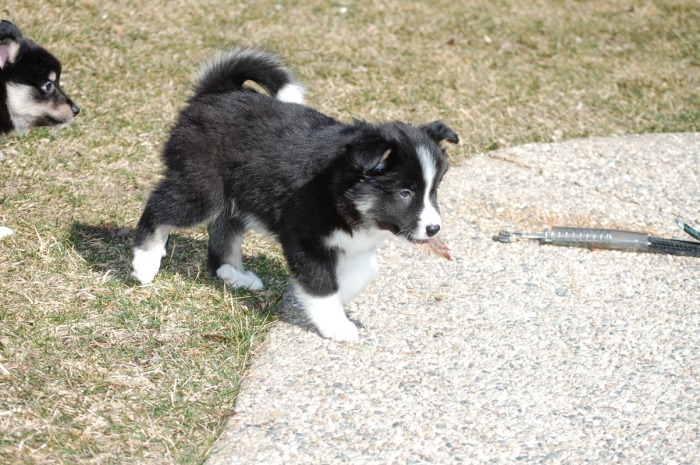 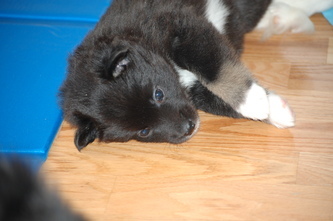 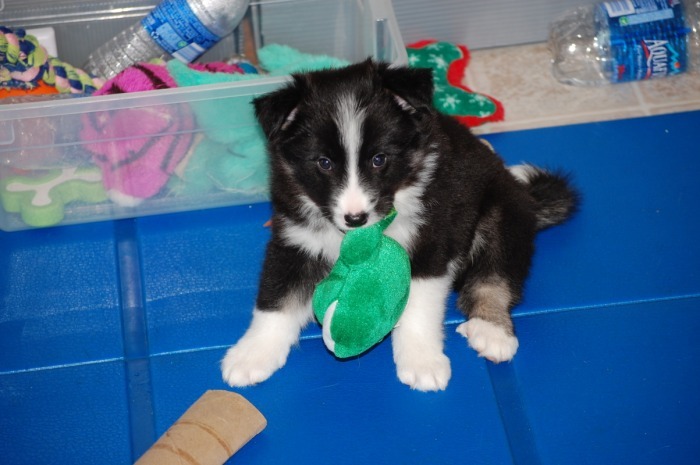 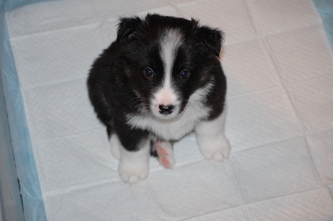 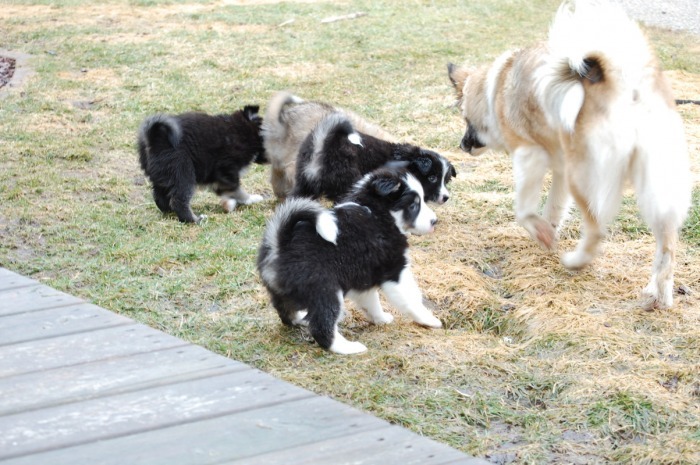 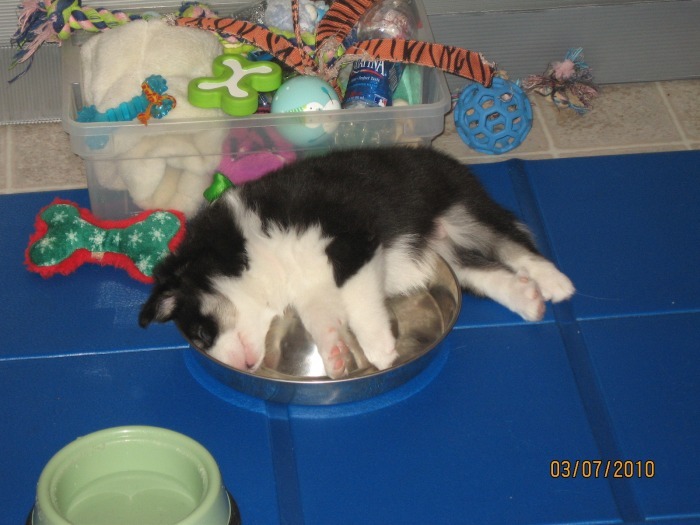 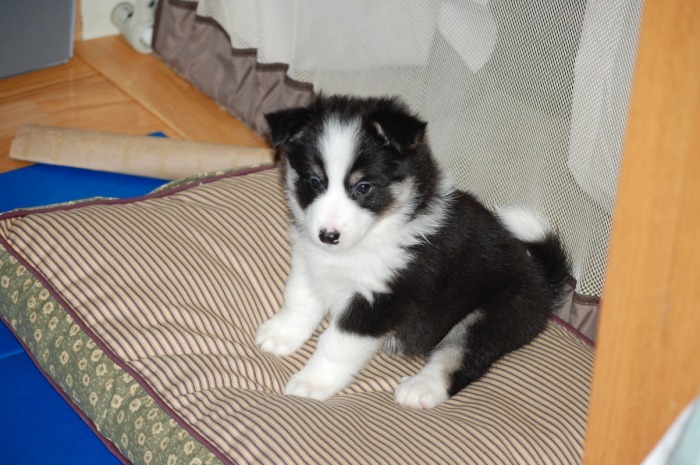 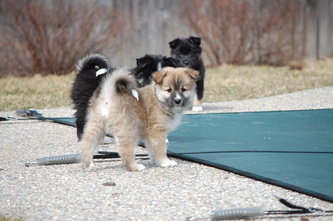 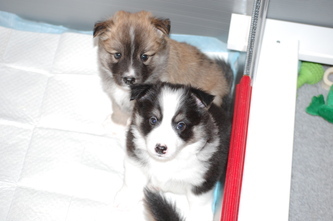 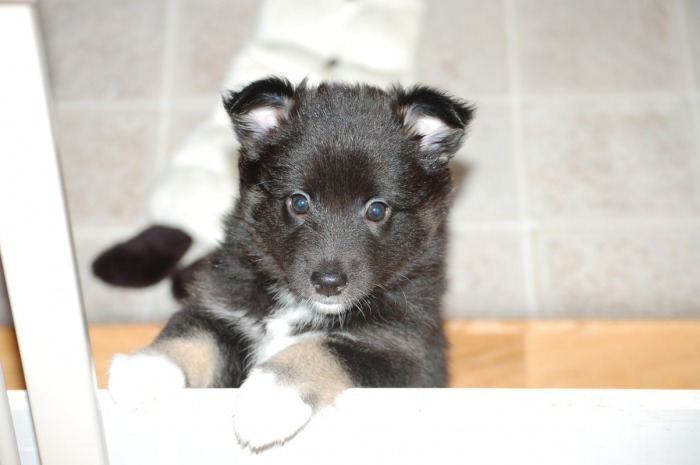 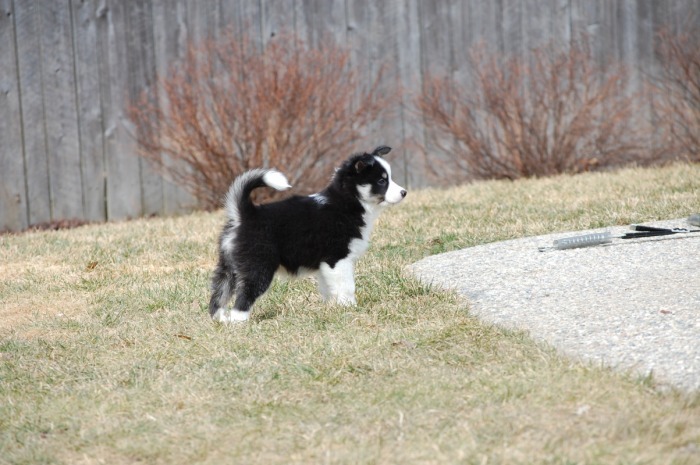 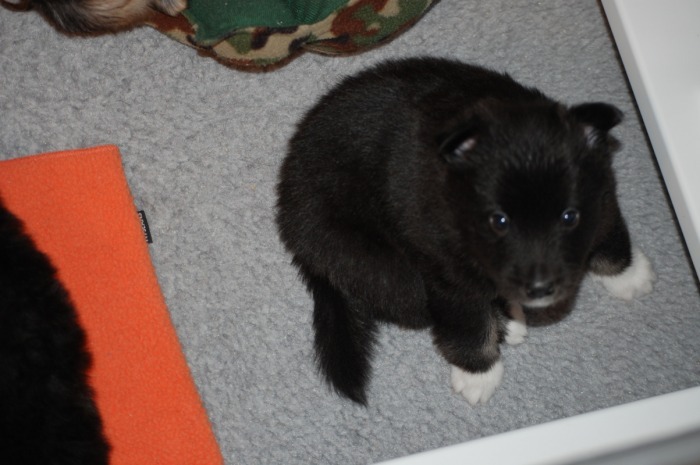 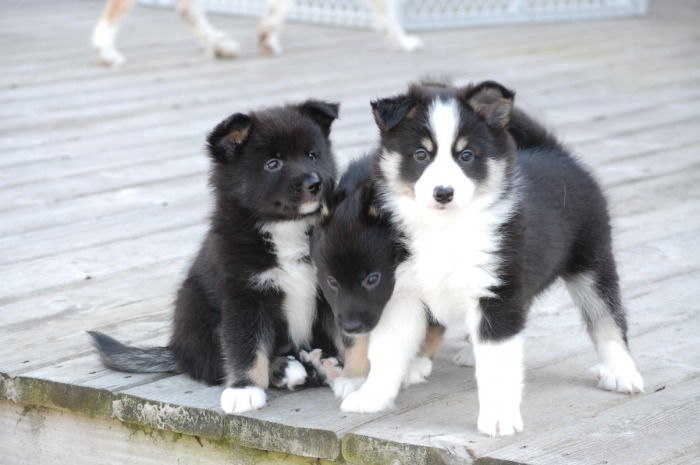 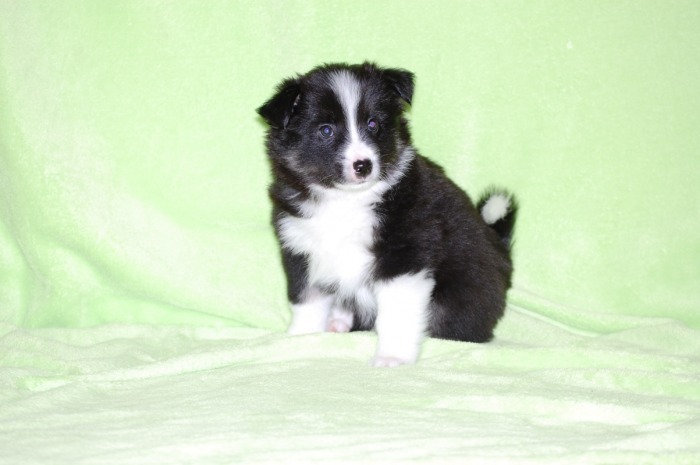 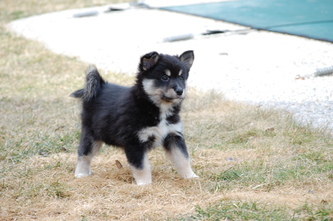 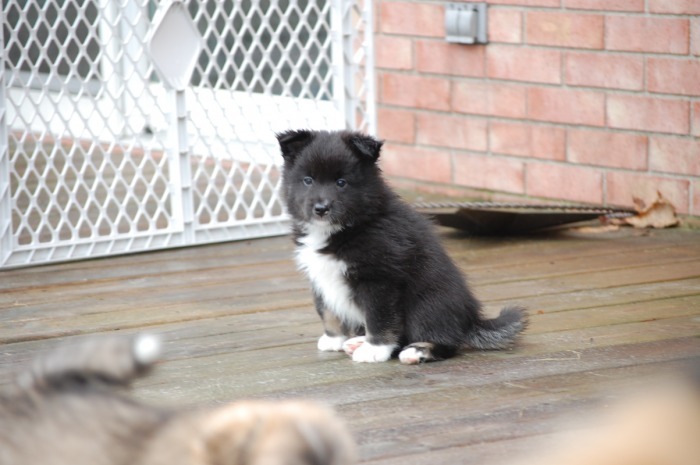 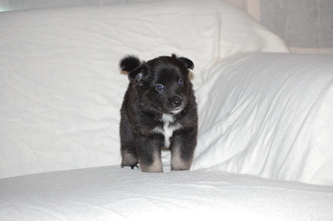 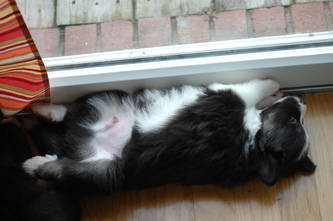 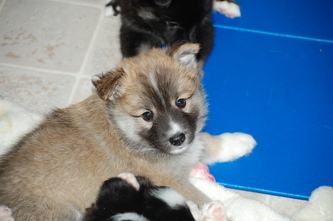 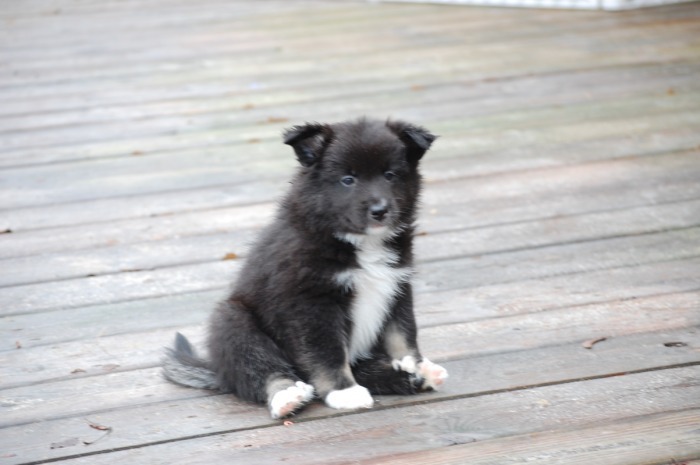 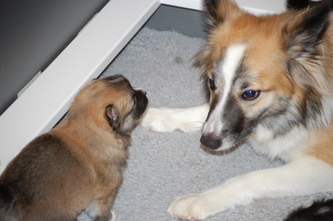 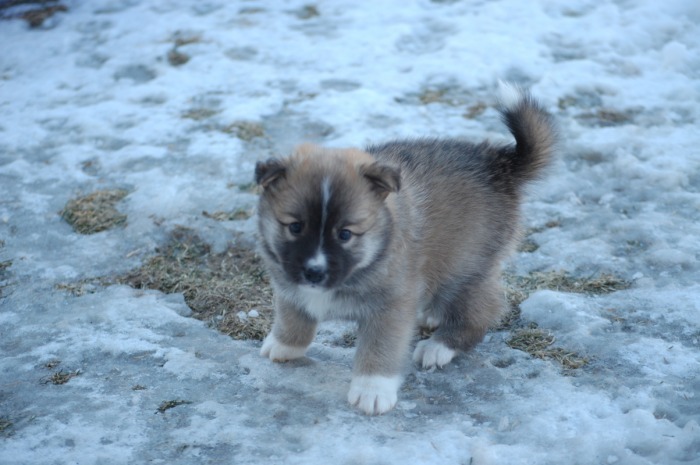 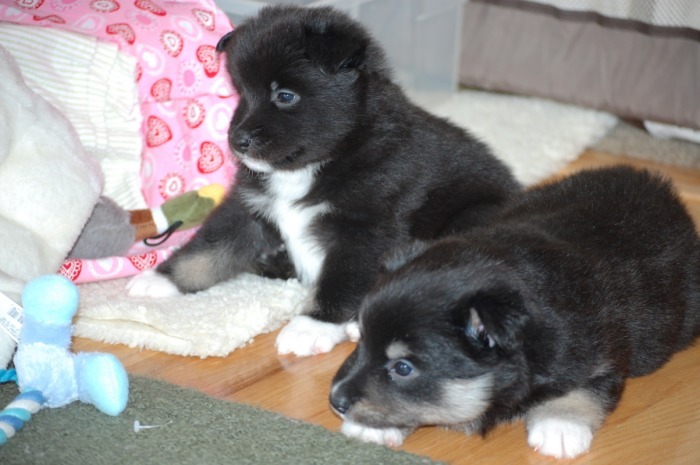 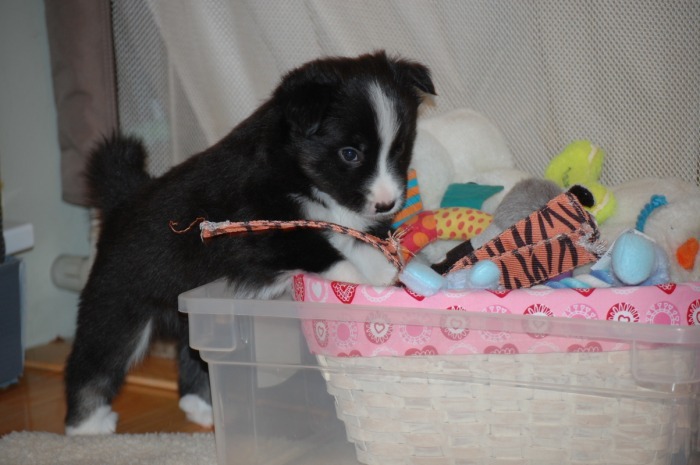 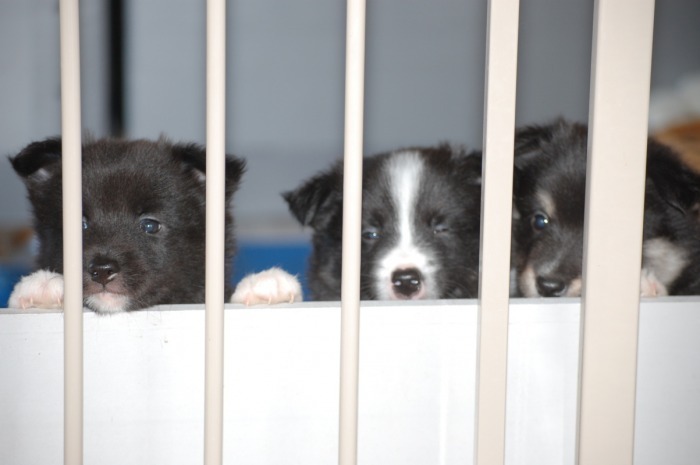 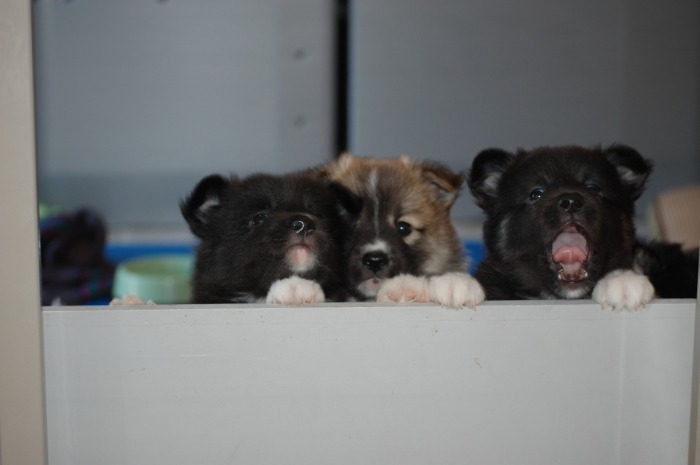 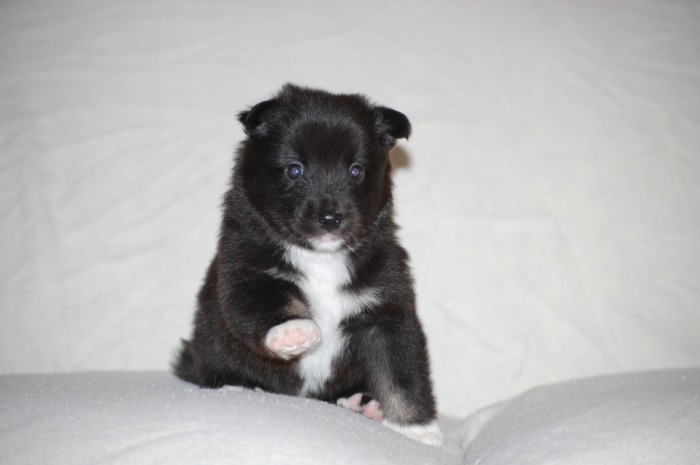 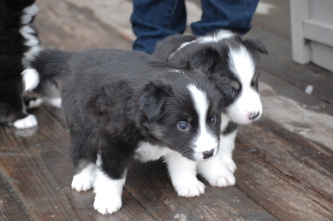 When you purchase a puppy from Tri-Star Icelandics what can you expect? 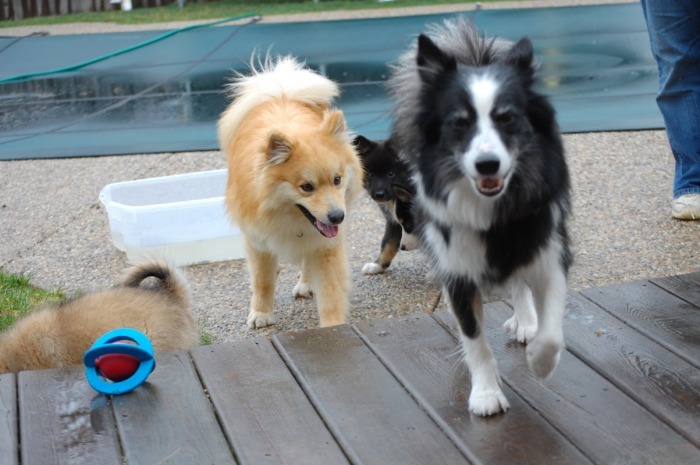 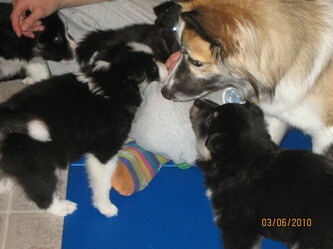 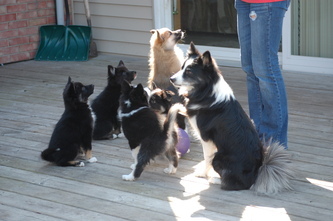 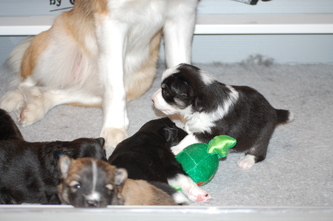 Each pupy goes home with some food, toys, collar and a piece of fleece with mom's scent on it. 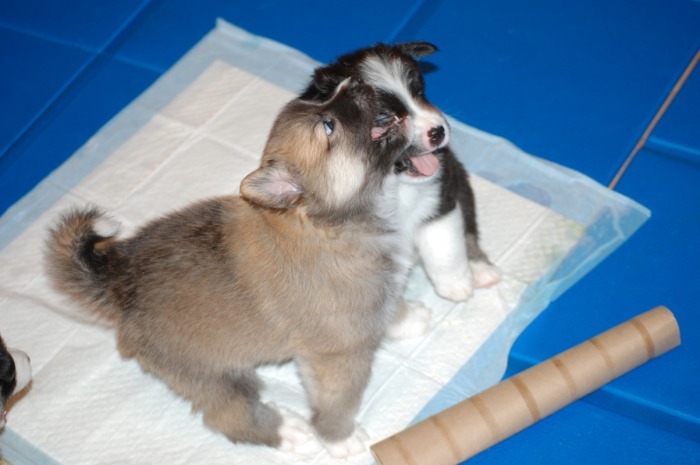 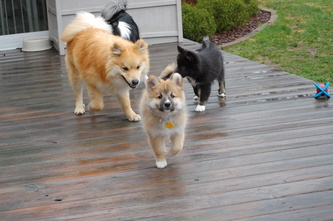 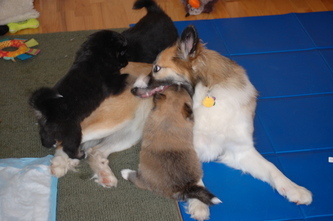 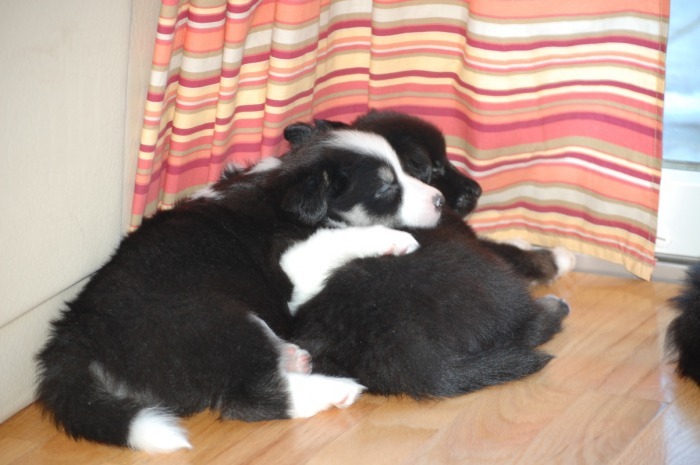 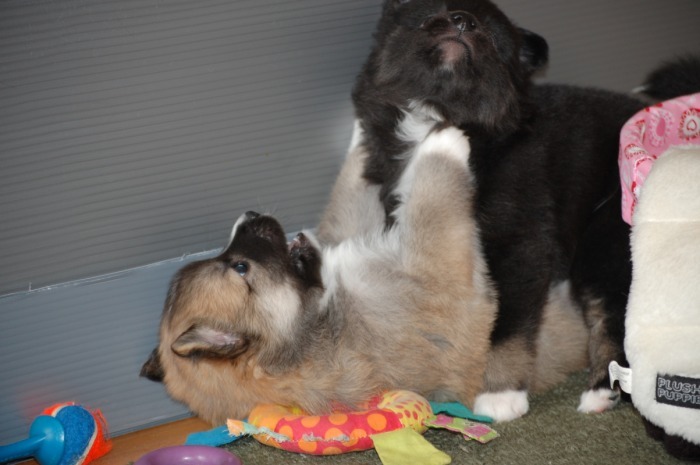 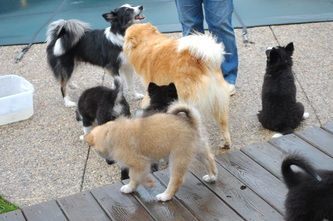 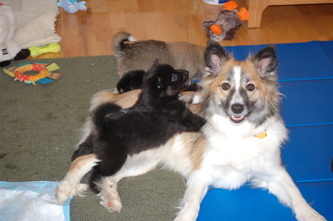 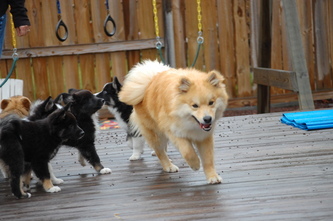 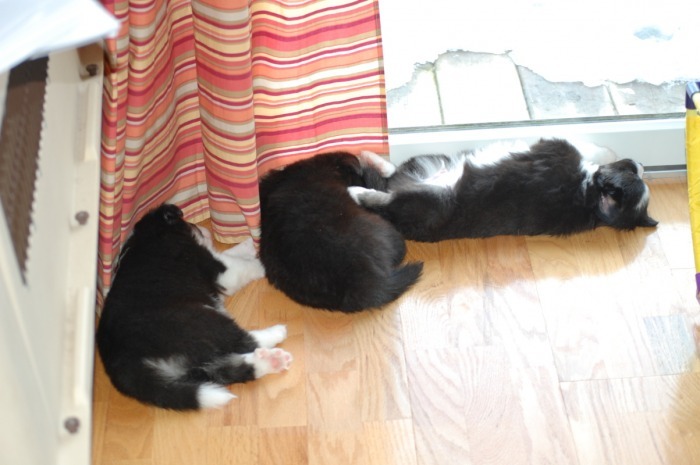 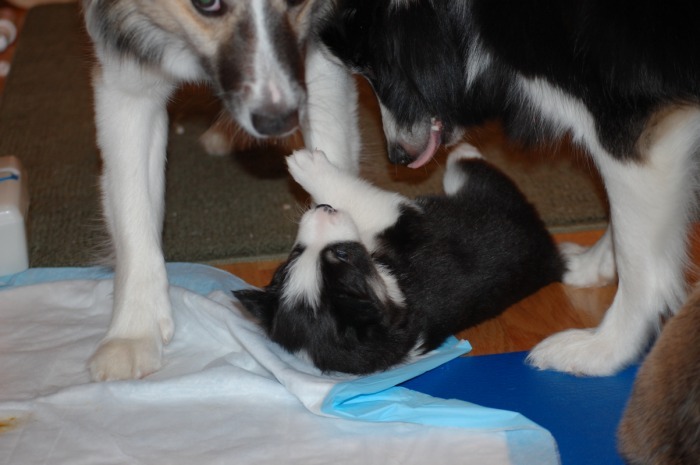 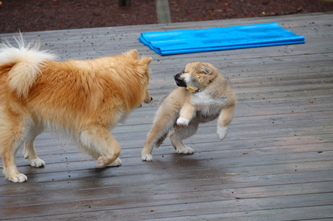 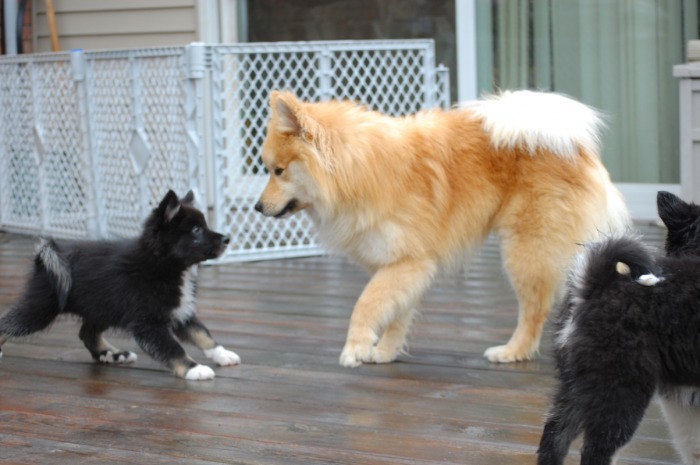 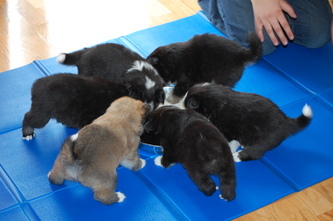 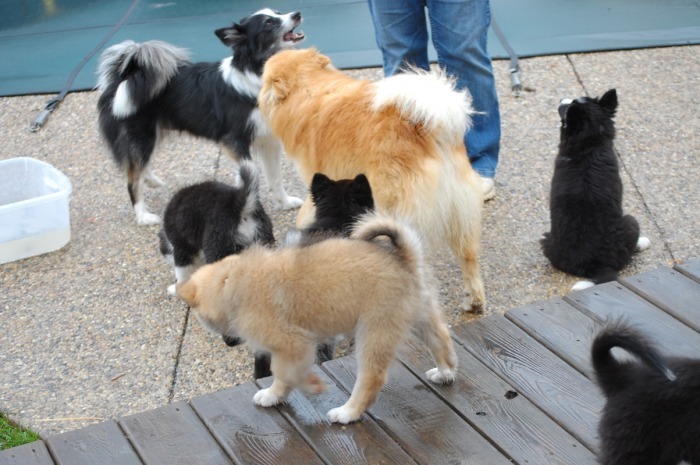 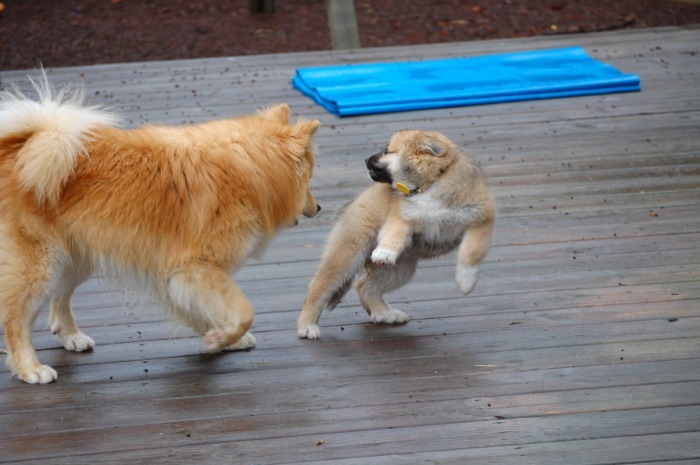 Our puppies are raised in our home with our family.They start out in the dining room. 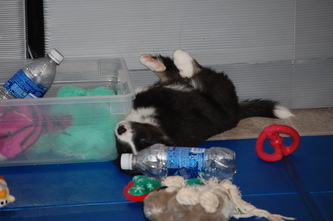 We do early neurological stimulation exercises on days 3-16. 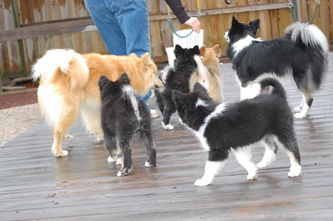 This is called the Super Dog Program. 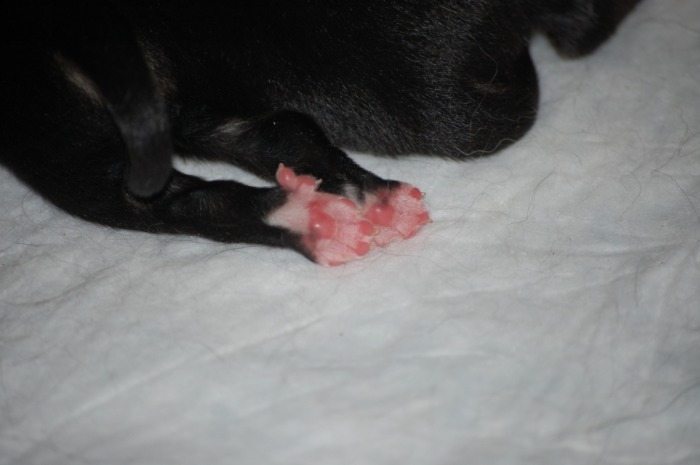 To learn more about it click on the link below.